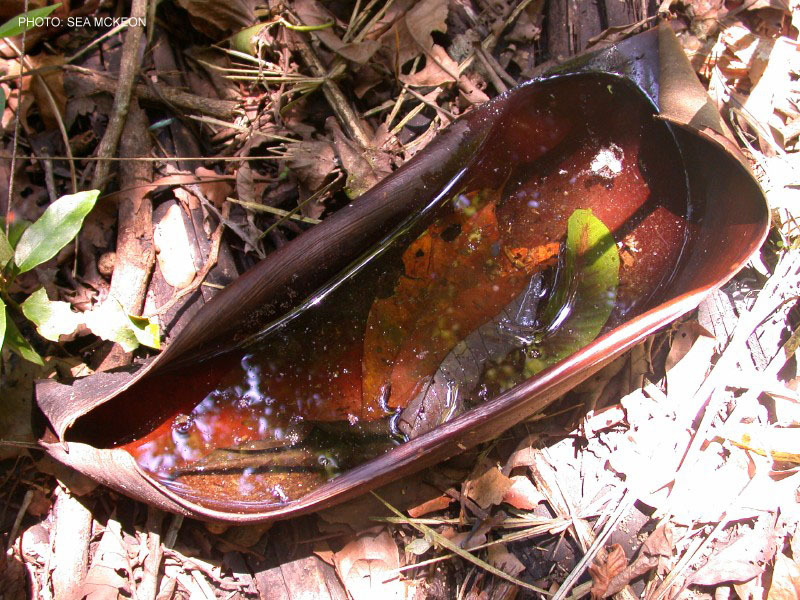 Poison frogs occupy various types of habitat. 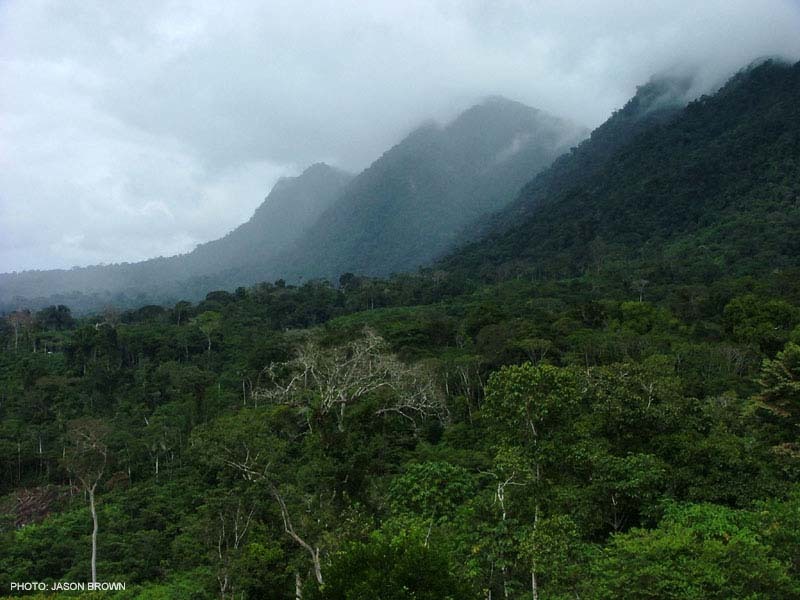 While many species are found in the lowlands (< 300 m), certain species range up to 2000 m or higher. 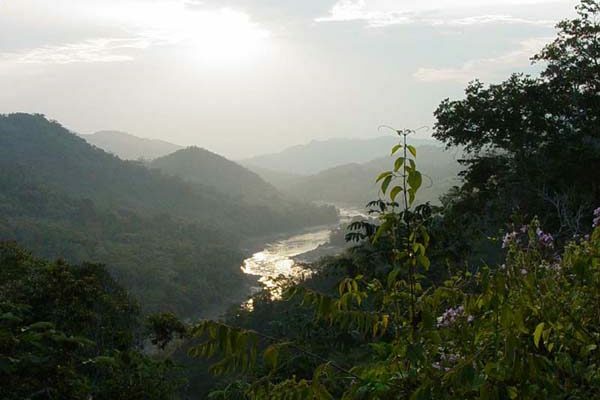 In Peru, most are found in the ‘transition zone’, a mid-elevation area (400-800 m) with many different valleys separated by ‘cordilleras’ (small mountain ranges). 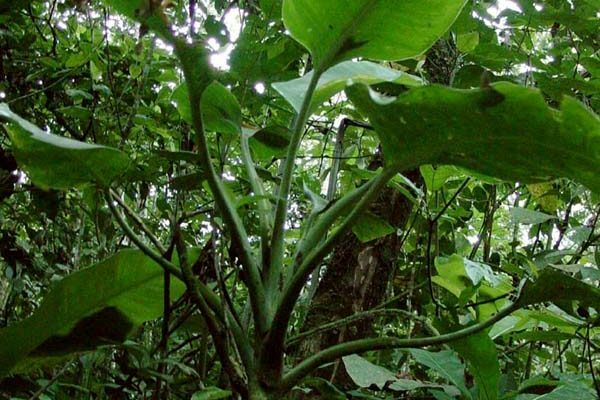 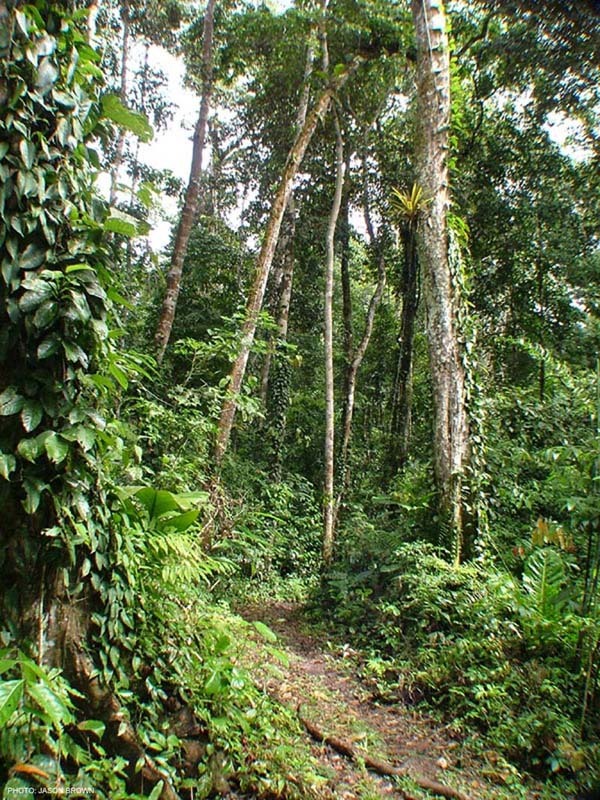 Compared to the mountains, lowland forest is hot, dry, and typically has few breeding resources for dendrobatids. 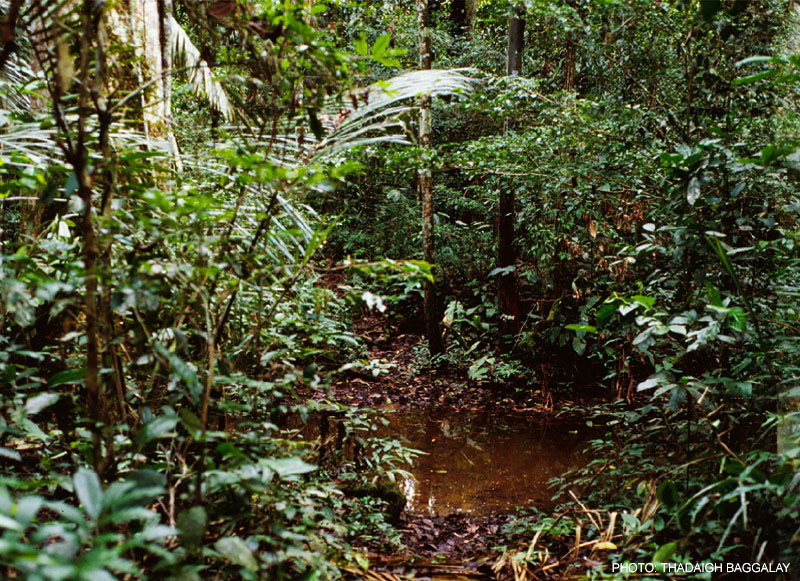 Still, poison frog diversity is high in the lowlands and most species are still found to be abundant. 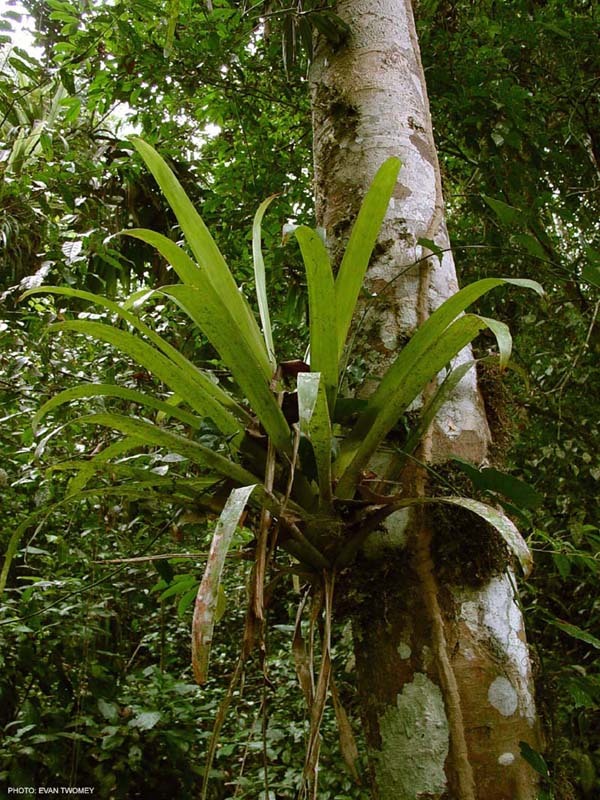 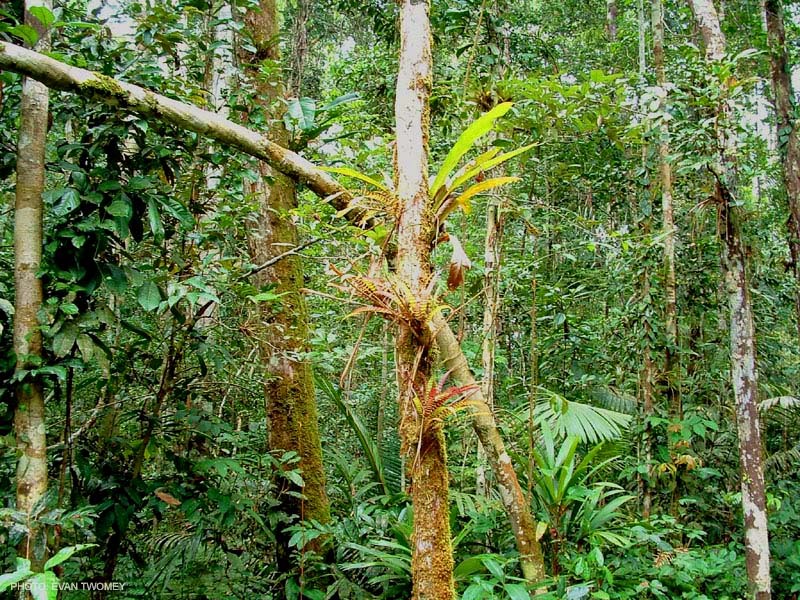 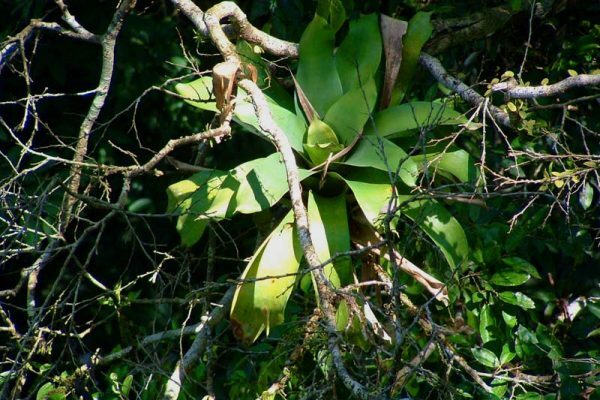 Bromeliads are less commonly found, except in the canopy or wet areas (e.g. 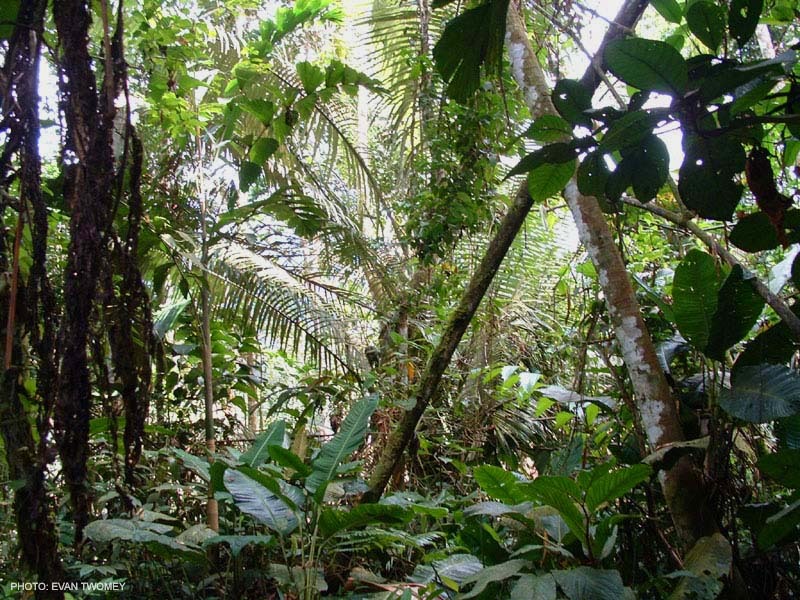 Iquitos). 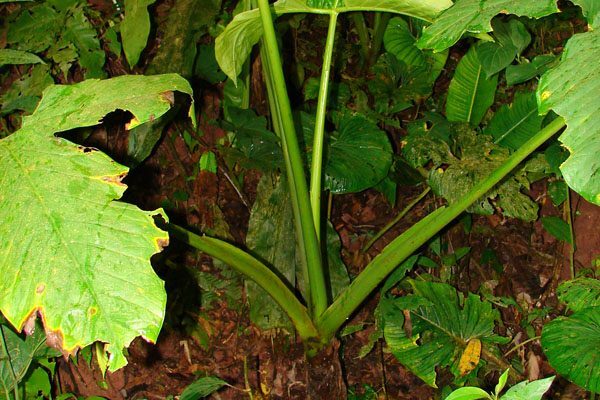 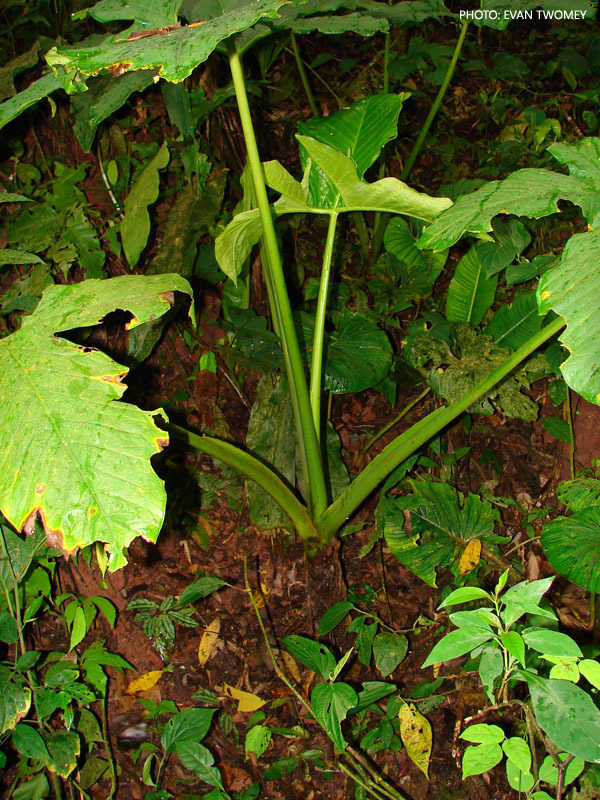 Xanthosoma are normally restricted to roadsides, which in the lowlands are too hot for most species. 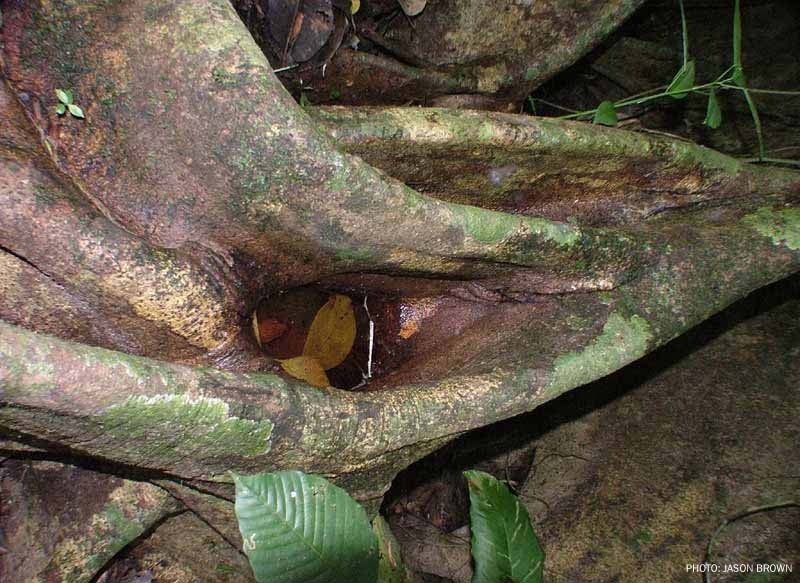 Tree-holes, however, seem to be more common, perhaps due to the presence of large trees with elaborate buttresses. 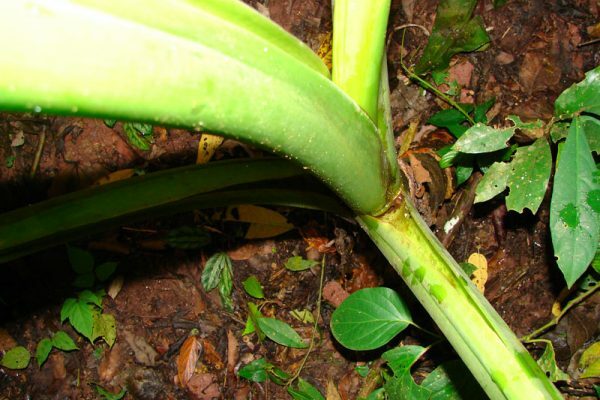 These structures are used by most species of Ranitomeya, as well as some terrestrial species such as Hyloxalus azureiventris. 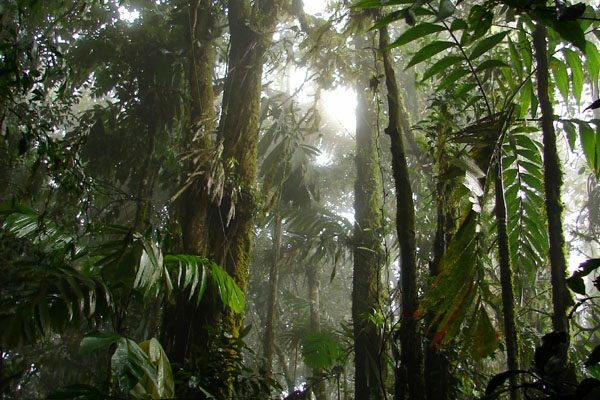 Due to the heat and lower humidity of the lowlands, most species are active only in the morning and evening, or during rainy periods. 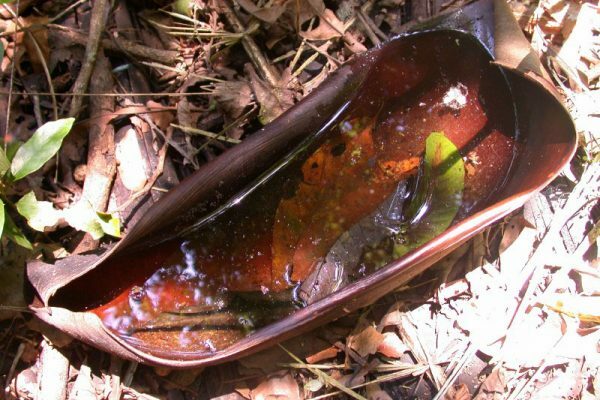 Some species, such as R. reticulata, have assumed a terrestrial lifestyle presumably to remain close to the humid ground, which allows them to be active throughout the day. 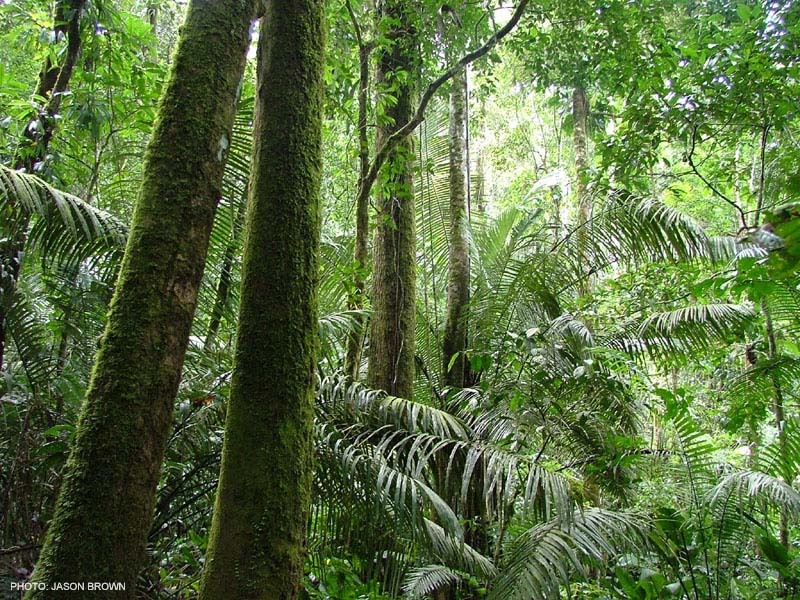 Most lowland forests surpass 30 C in the day, and may only drop to 27 C at night. 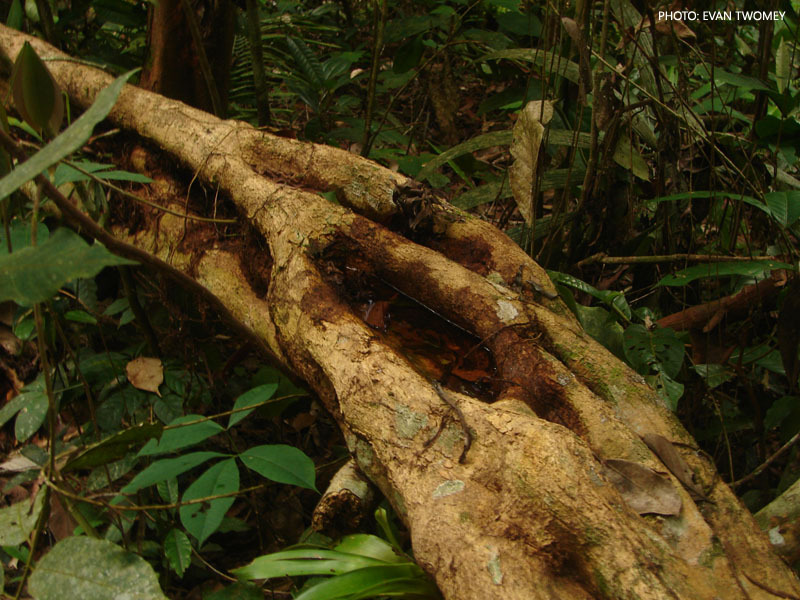 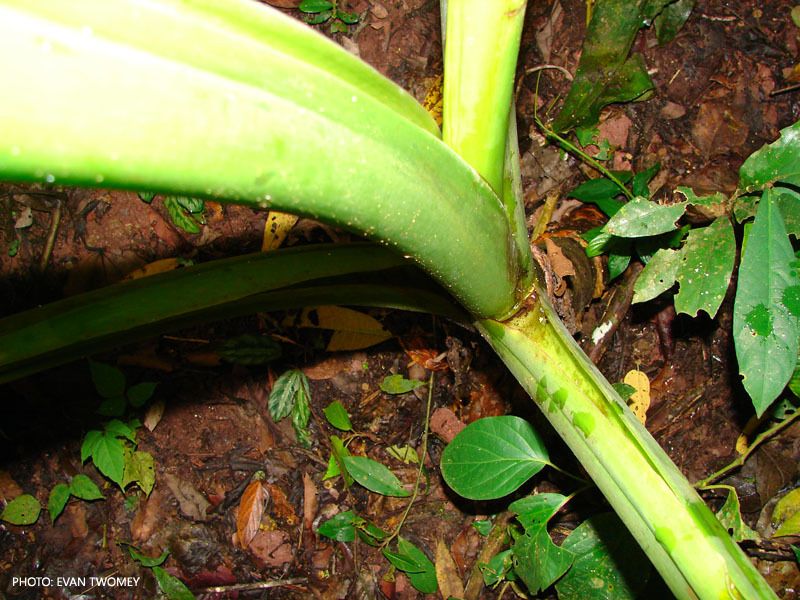 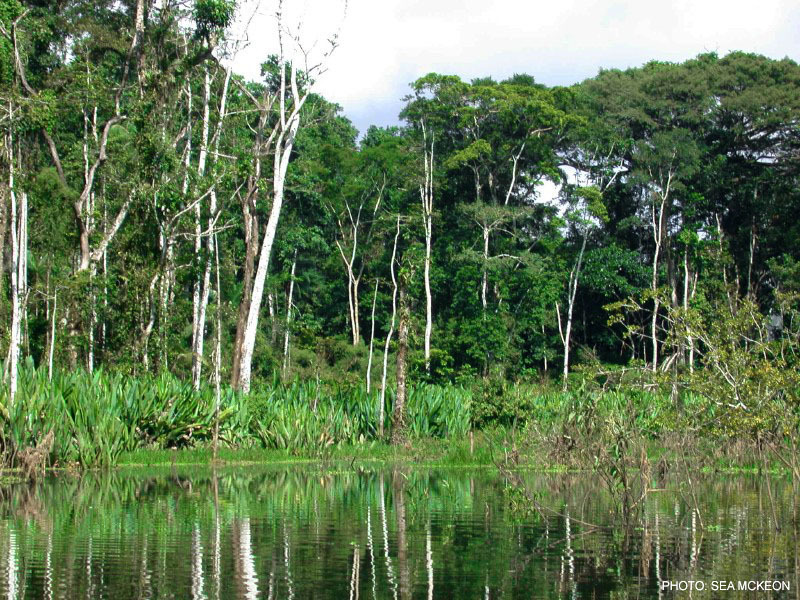 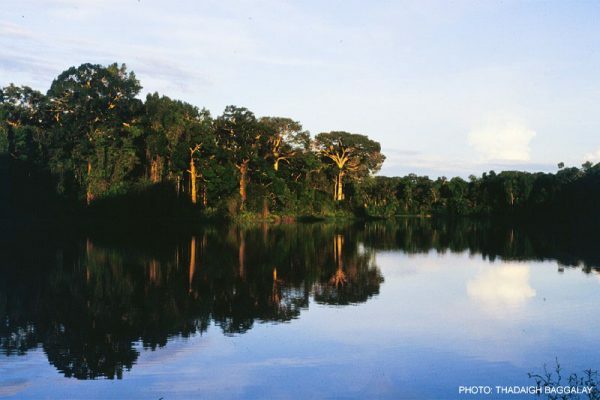 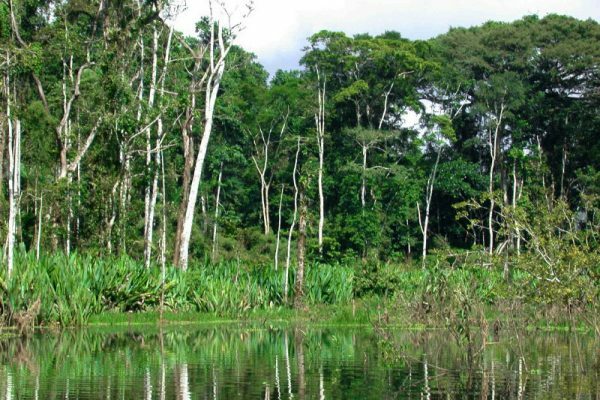 The most common breeding resources in the lowlands include treeholes, small puddles or pools, bromeliads, and Heliconia. 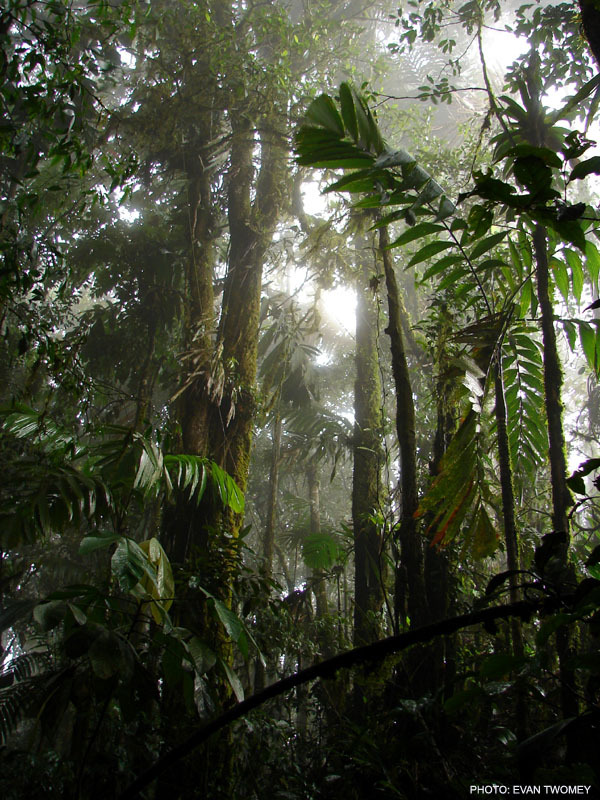 The forest between the lowlands and highlands contains the highest dendrobatid diversity of all forest types. 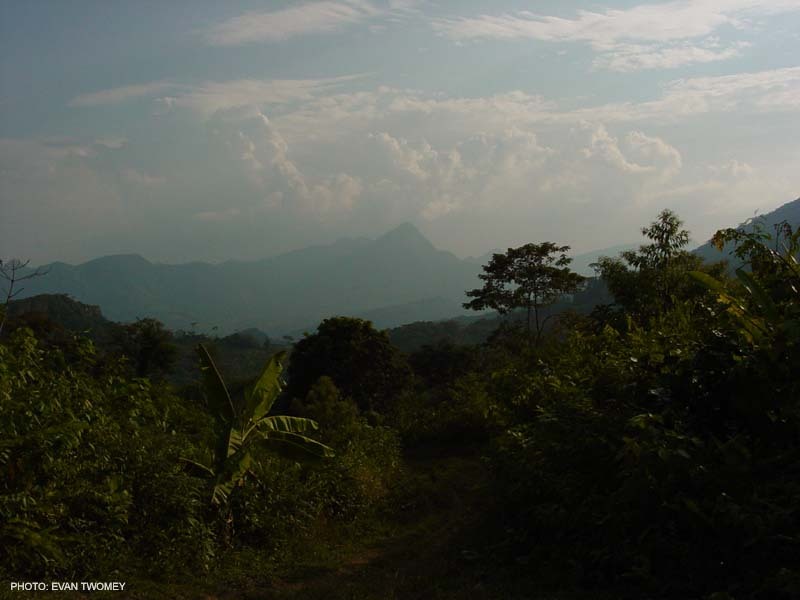 The lower range (300 m) may contain lowland species, around 500 m these species frequently drop out and are replaced by highland specialists. 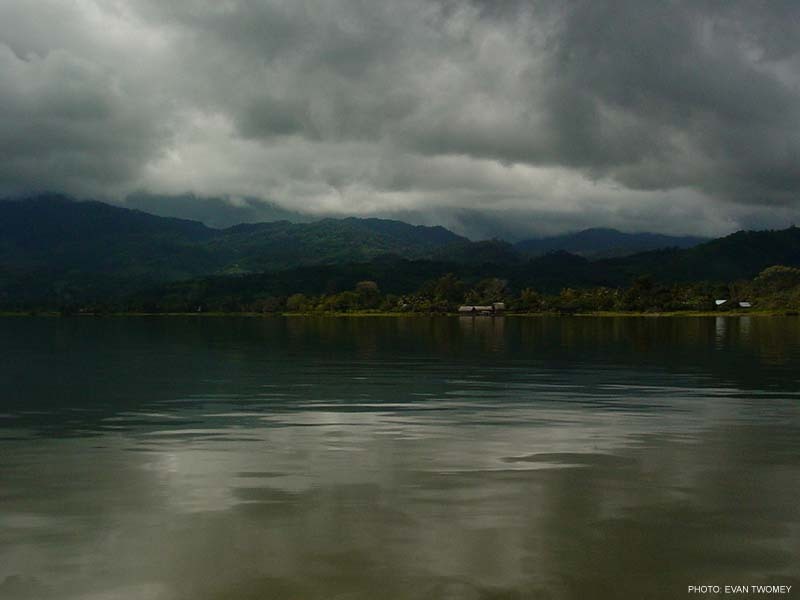 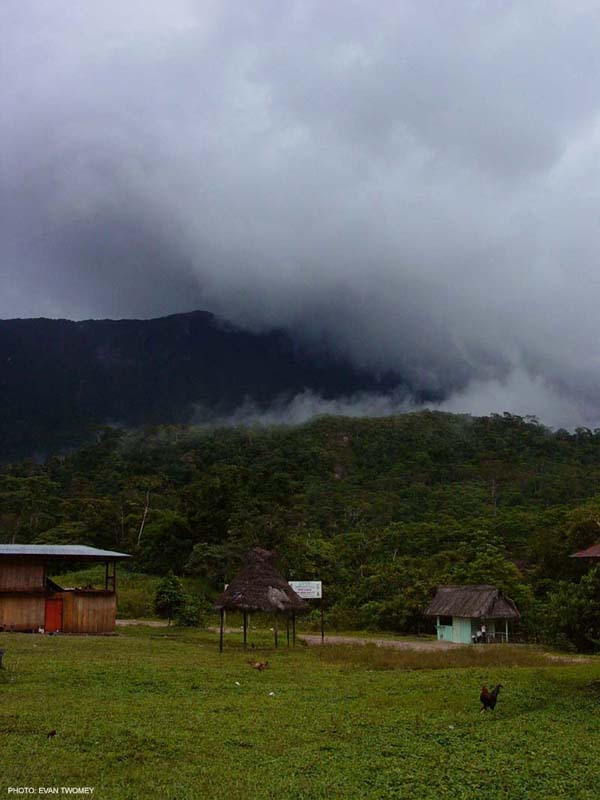 For example, Ameerega pongoensis ranges to about 400 m elevation – from here up it is replaced by A. bassleri. 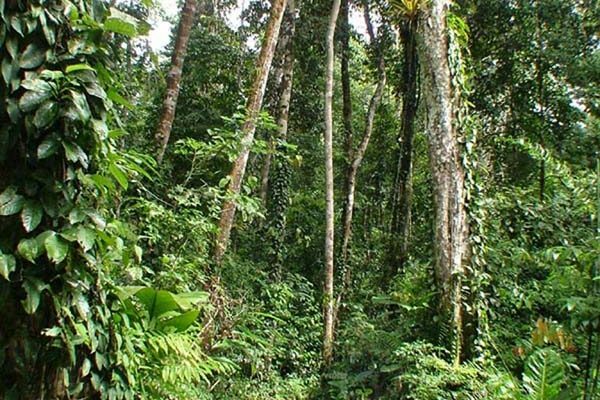 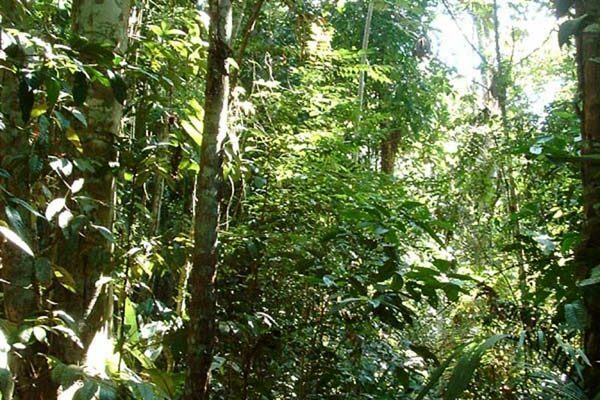 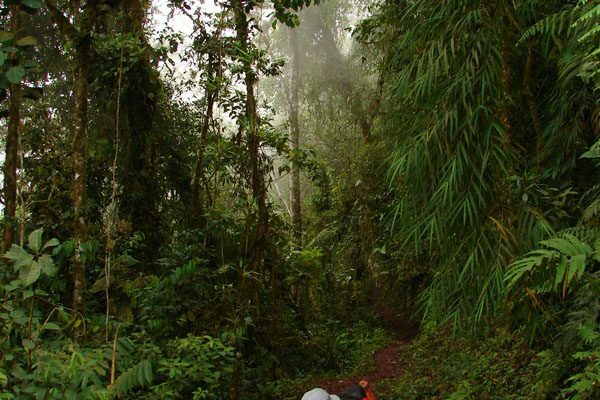 This narrow zone between 350 and 550 meters is known as the transition zone and is responsible for exceedingly high faunal diversity in small areas. 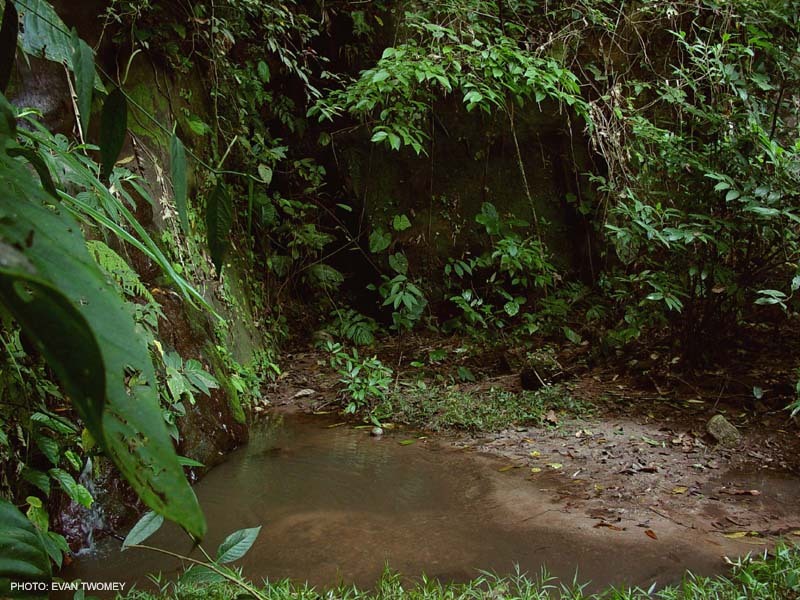 The Cainarachi valley and Panguana (Rio Pachitea drainage) are both classic dendrobatid transition zones. 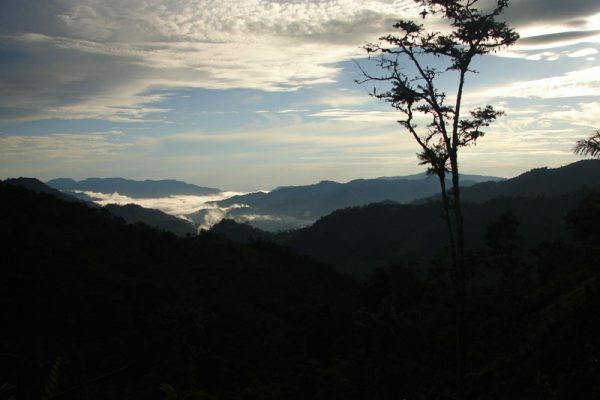 One can see a wide range of habitats within premontane areas. 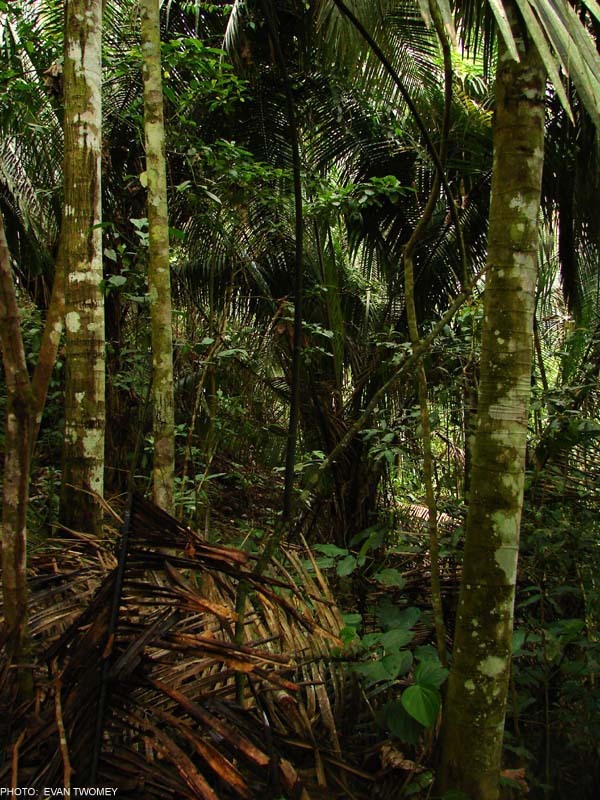 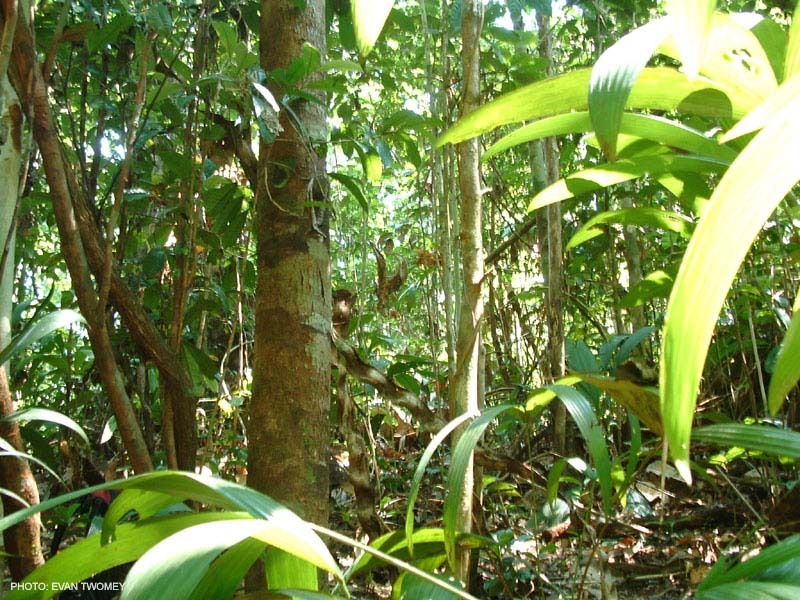 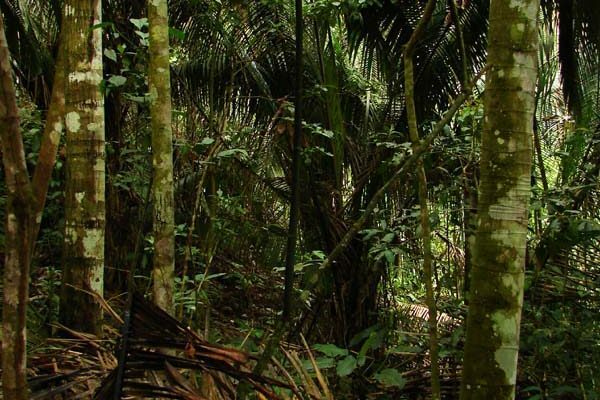 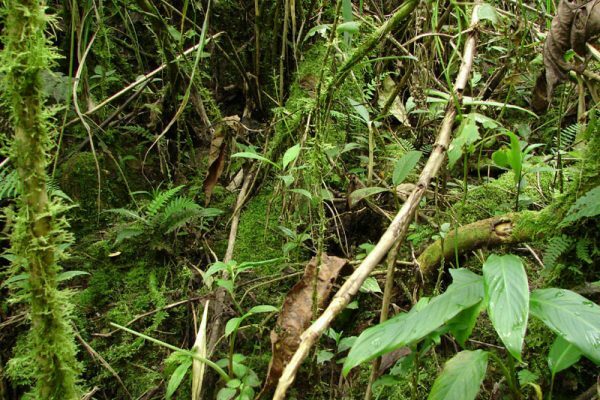 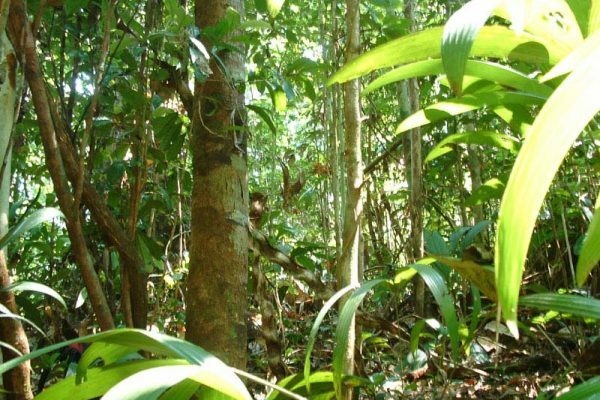 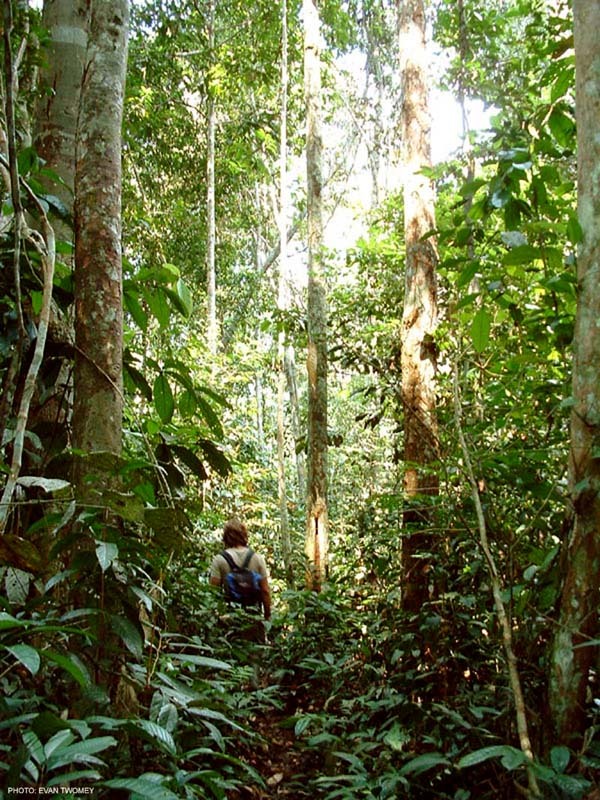 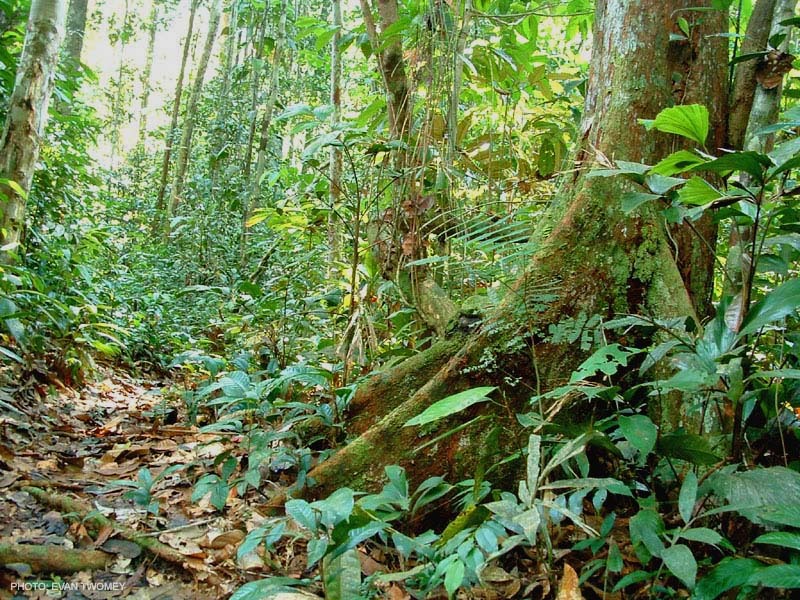 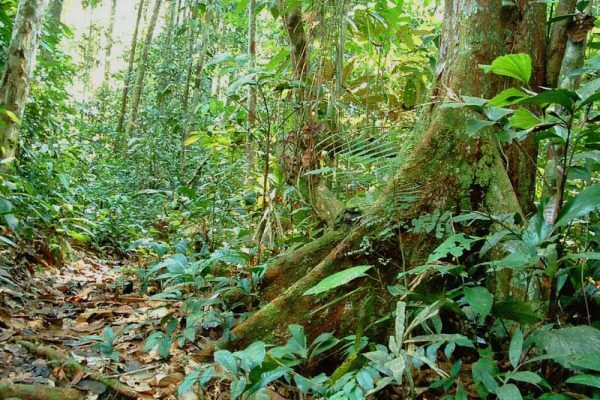 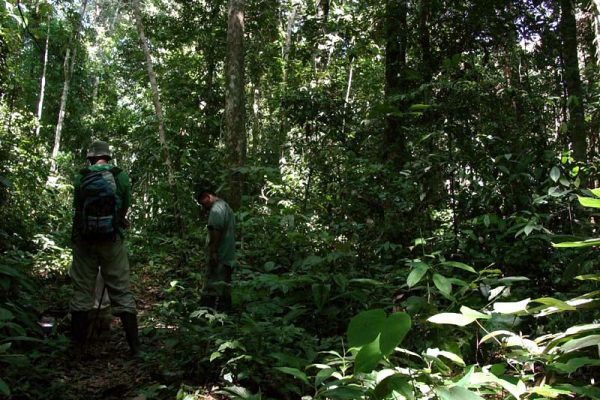 The Aguaytia shelf near Pucallpa is a cool and moist area home to many species of Ameerega. 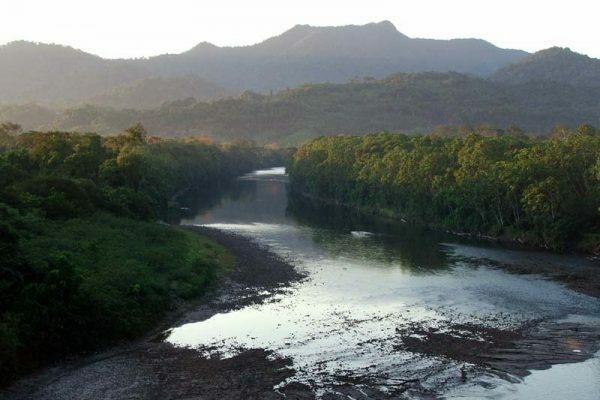 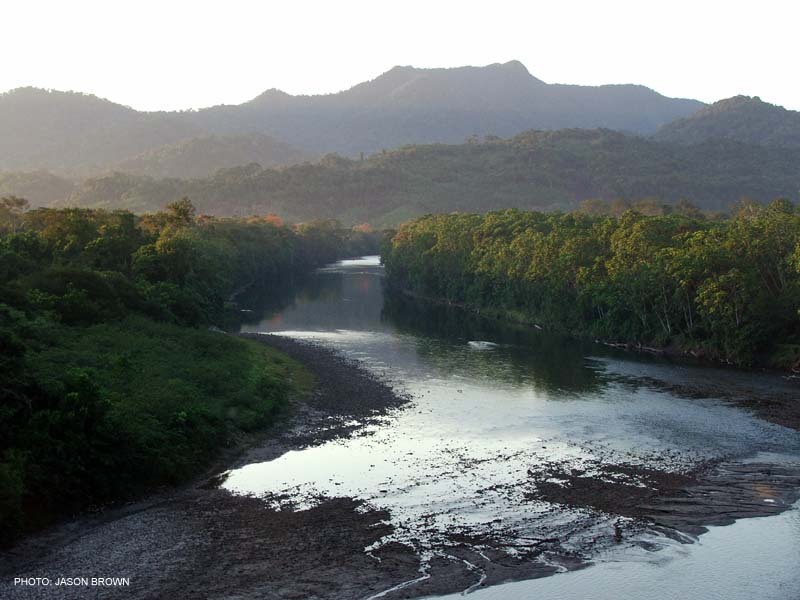 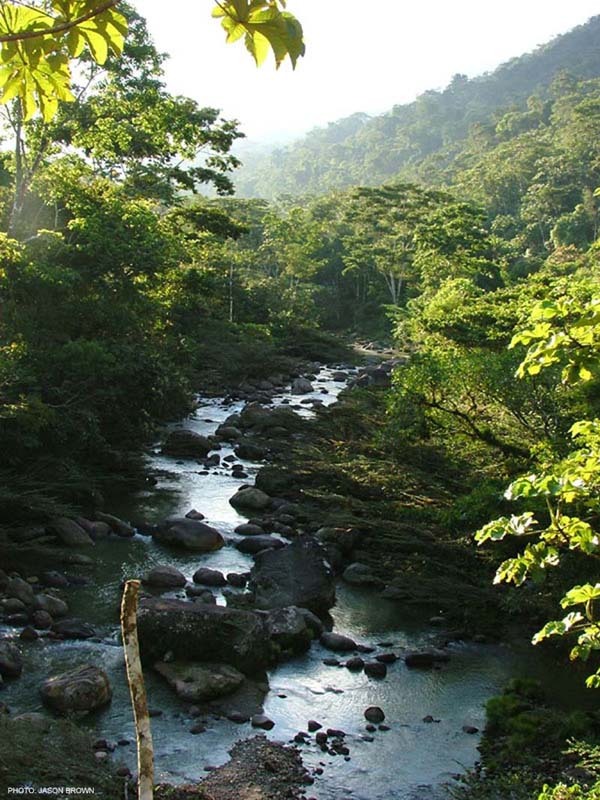 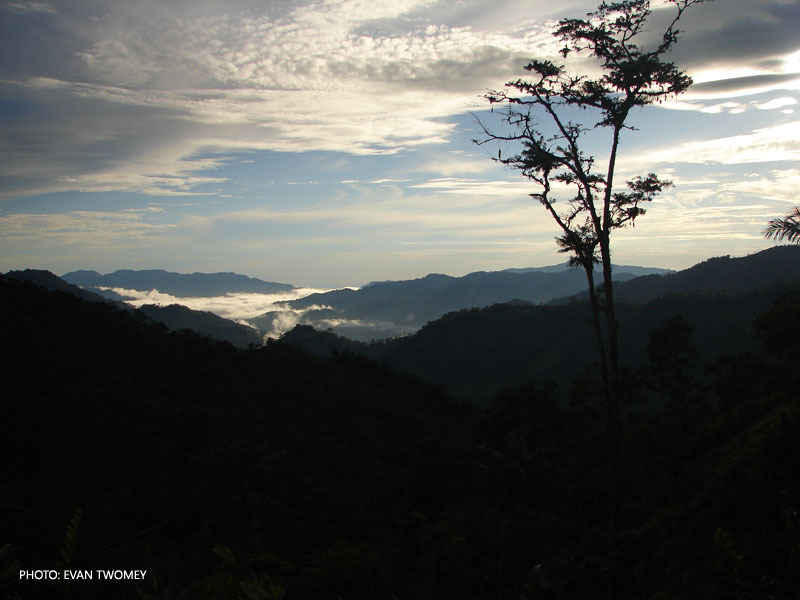 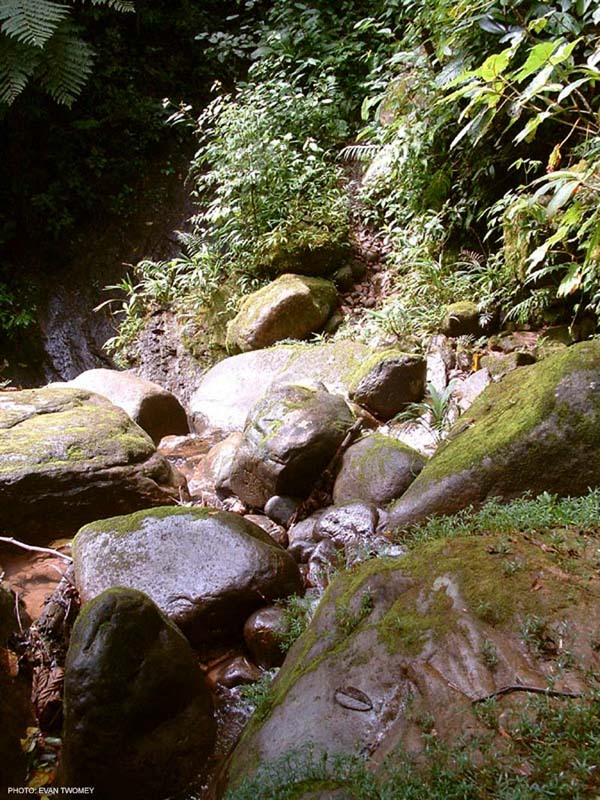 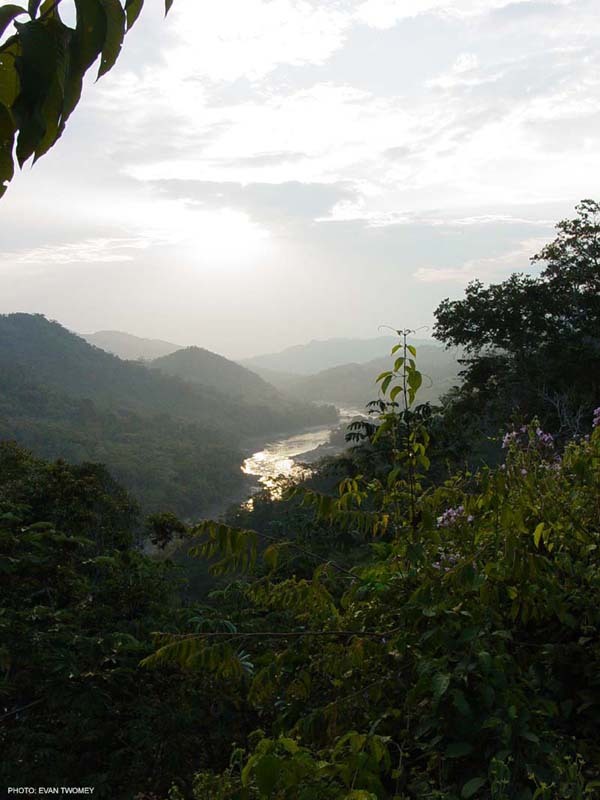 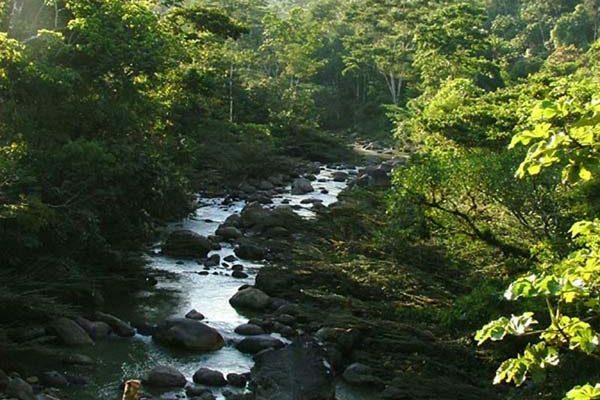 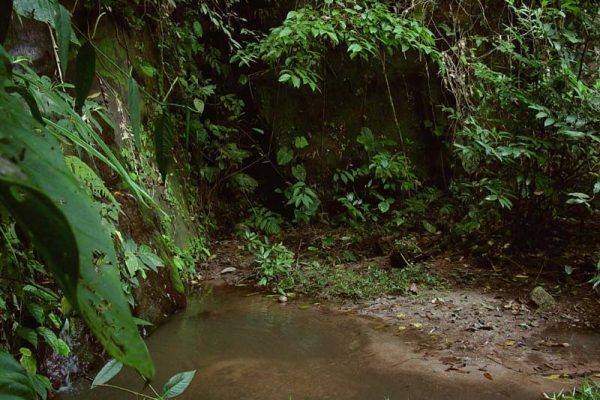 The rugged Cordillera Oriental near Tarapoto contains swift streams, with high morph endemism and habitat heterogeneity. 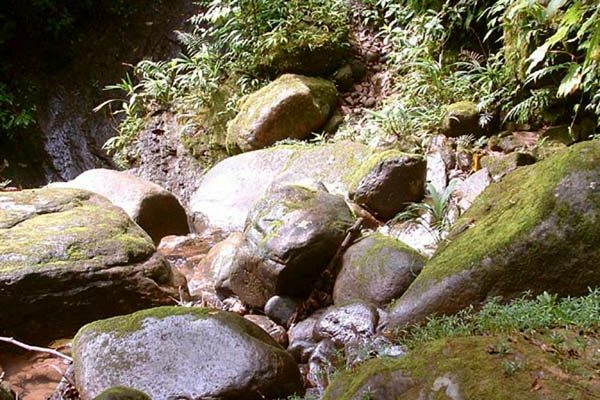 These streams are home to many species of Atelopus, hylids, and centrolenids. 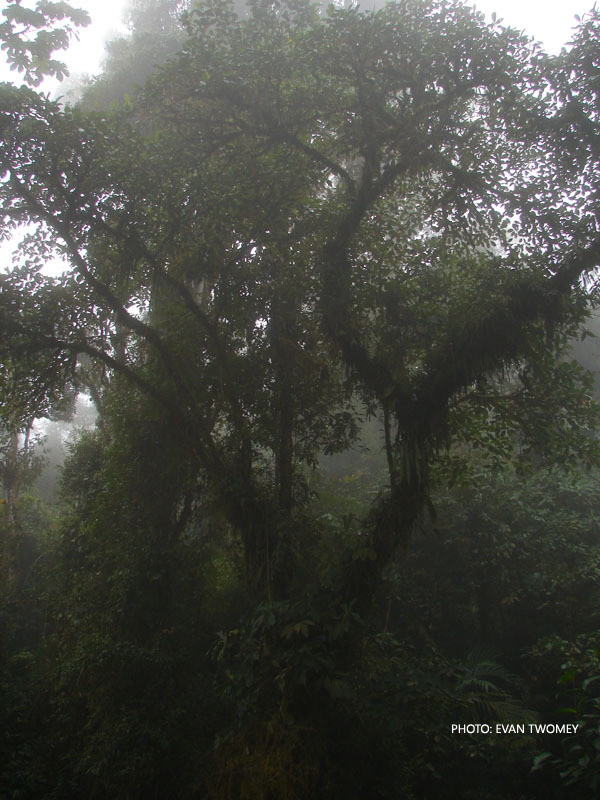 Premontane forest is normally 24-27 C in the day with a slight drop at night. 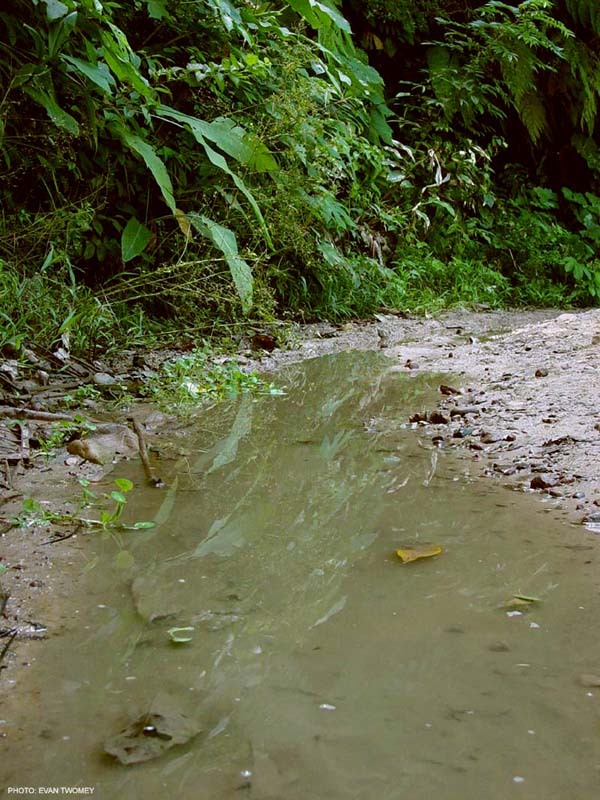 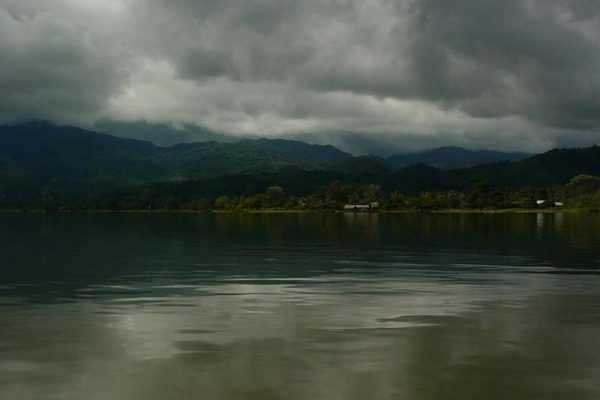 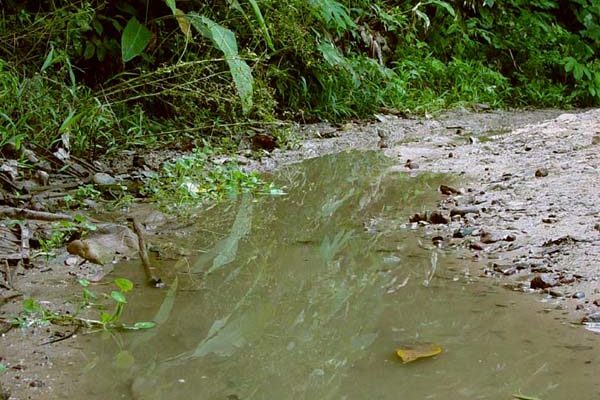 In Northern Peru, the months of January, July, and August have a marked decrease in rainfall. 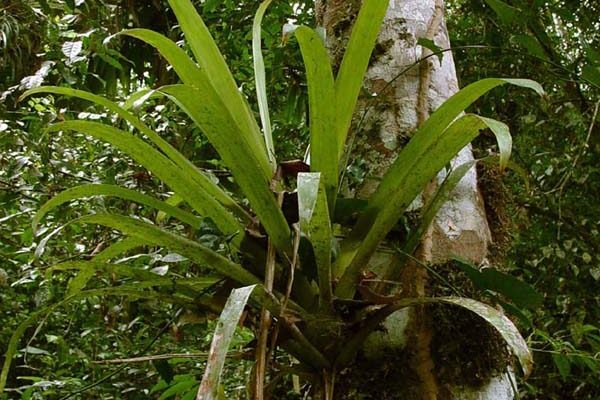 As you move up in elevation, bromeliads tend to get more common while tree holes tend to be less common. 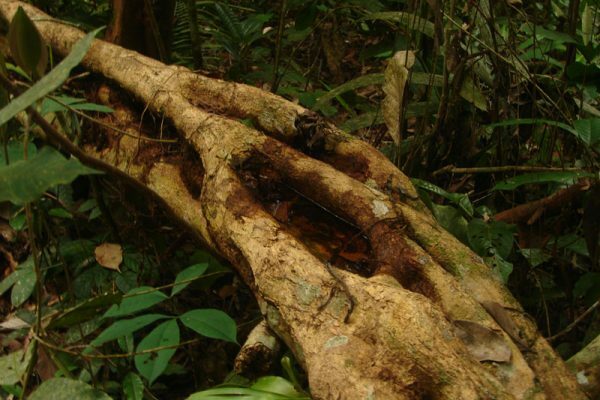 This is probably because large, buttressed trees that contain many tree holes tend to grow more in lower elevations, while trees in the highlands tend to be smaller with less-elaborate buttresses. 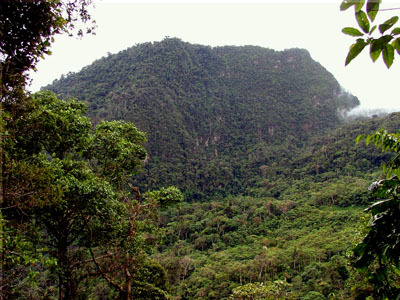 Most premontane habitat is relatively wet and contains bromeliads, though they are often concentrated in specific areas such as ridgelines or alongside streams. 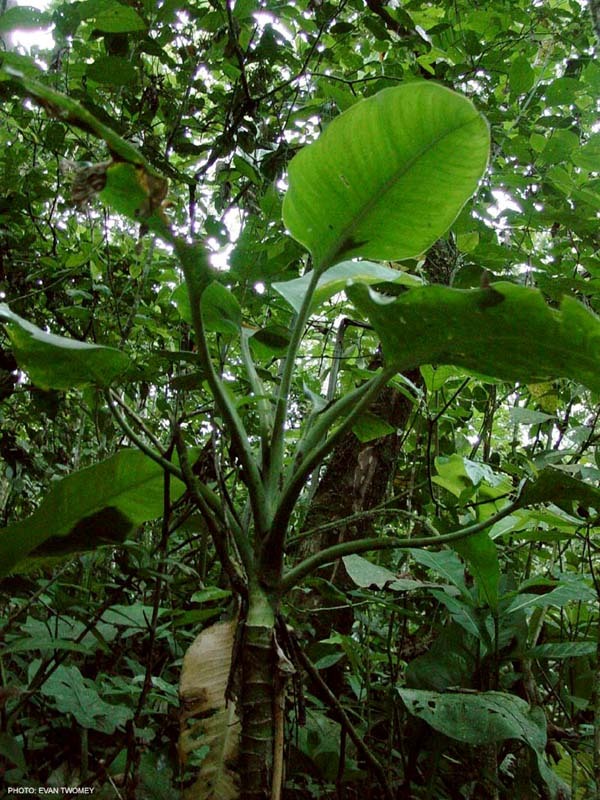 Heliconia and Xanthosoma can be found in great abundance, which are used by species such as Ranitomeya imitator and R. sirensis for breeding. 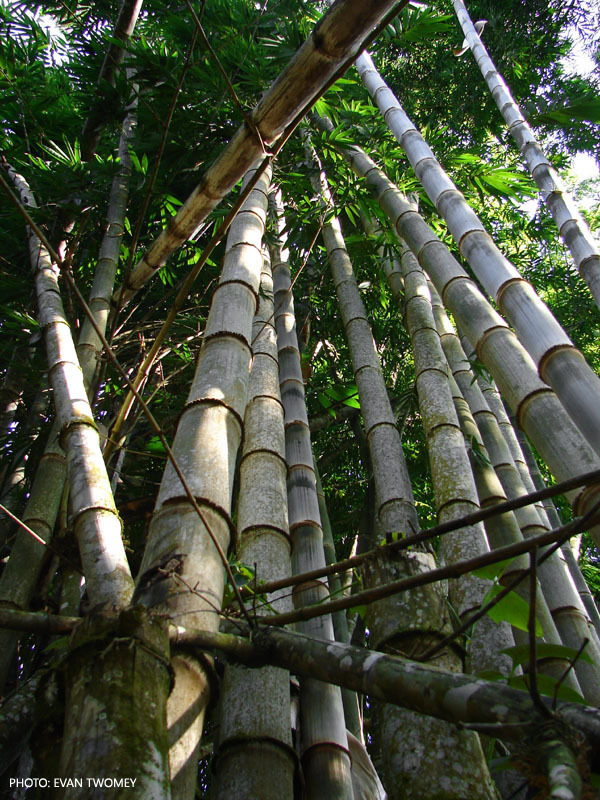 The bamboo forest near Tingo Maria (650 m) is one of the strangest sights we’ve seen. 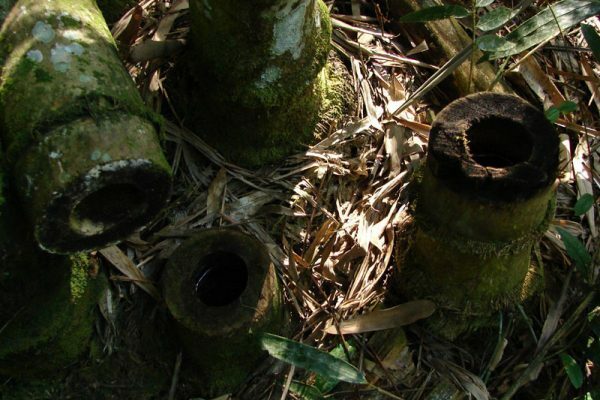 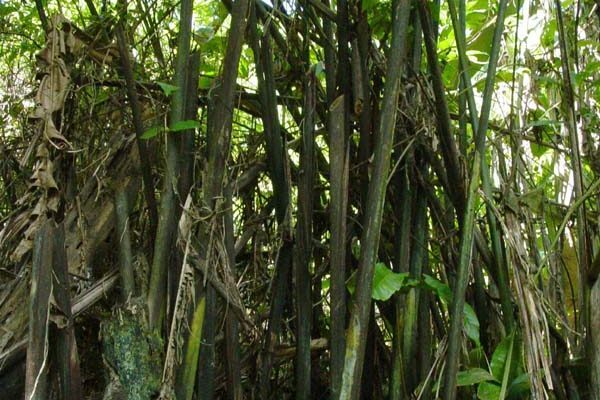 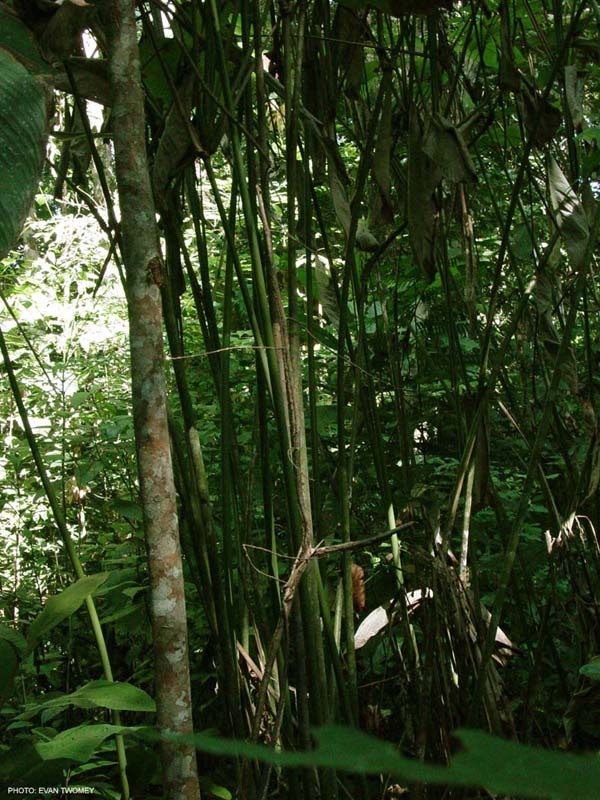 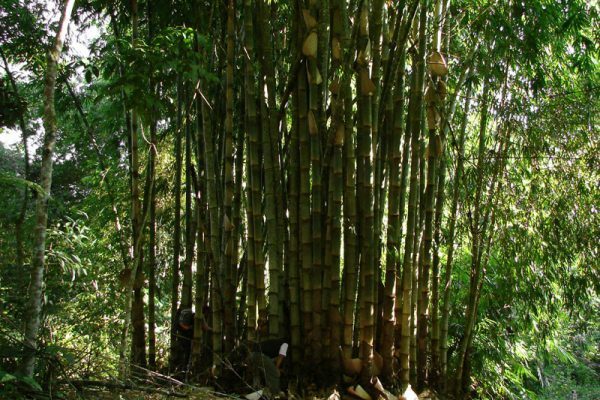 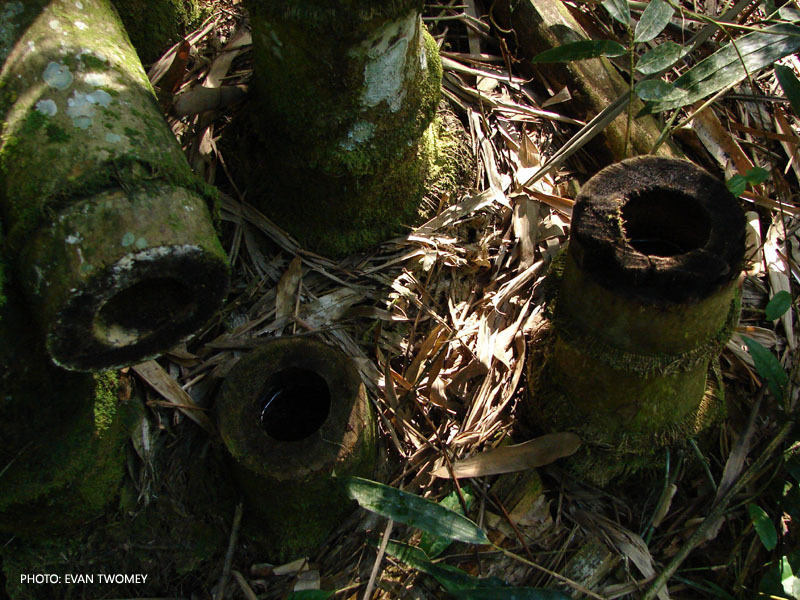 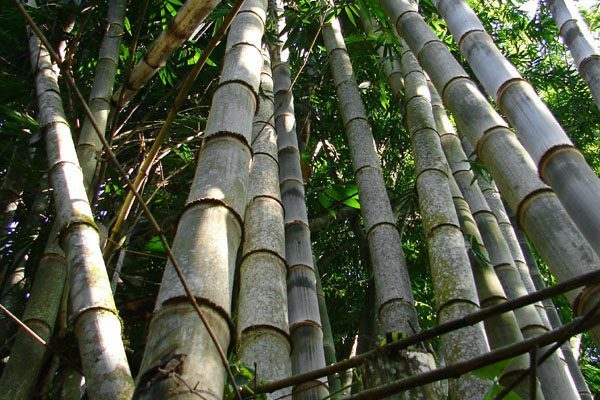 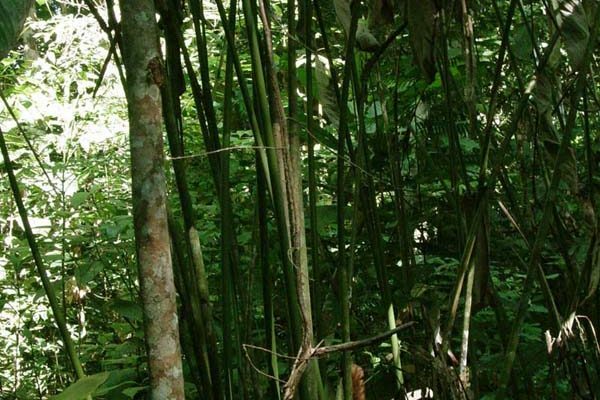 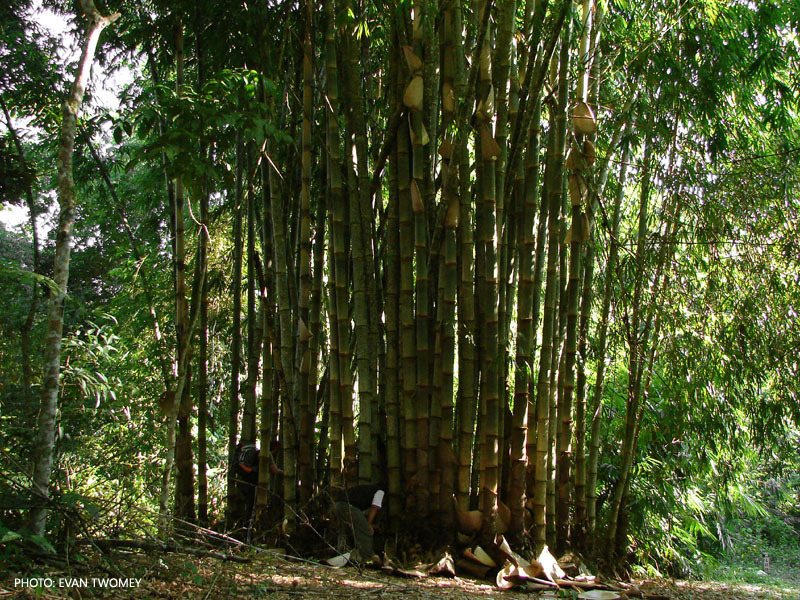 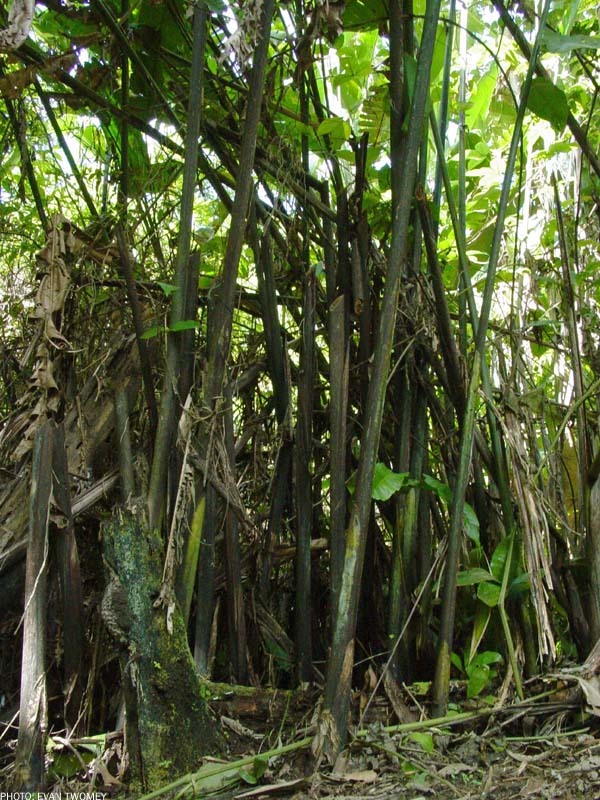 Here, R. sirensis can be found breeding in clusters of enormous bamboo. 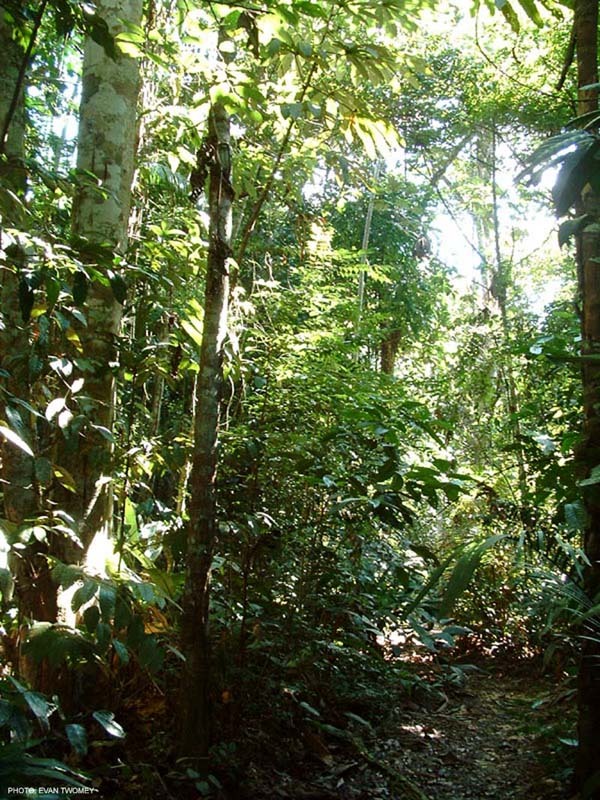 These dense clusters exclude most other vegetation, and walking through this sparse, dry habitat feels much like a temperate forest in the middle of the summer. 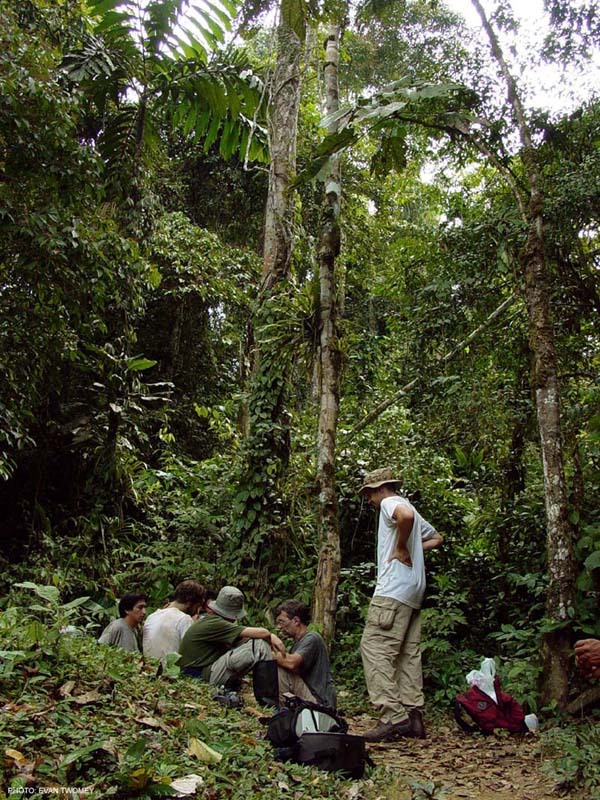 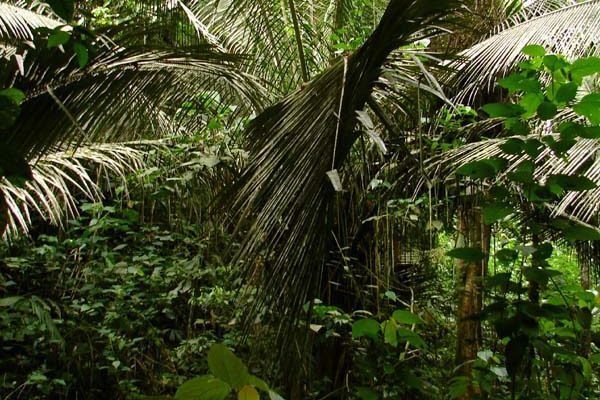 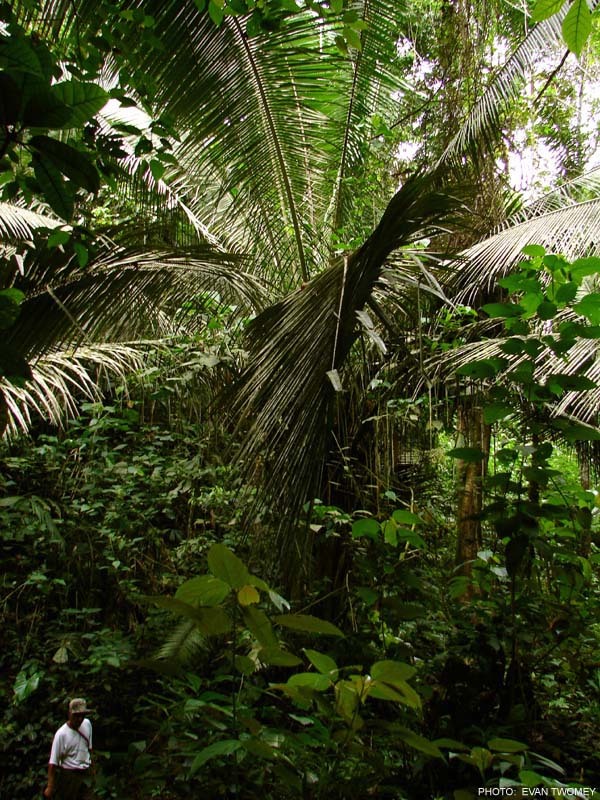 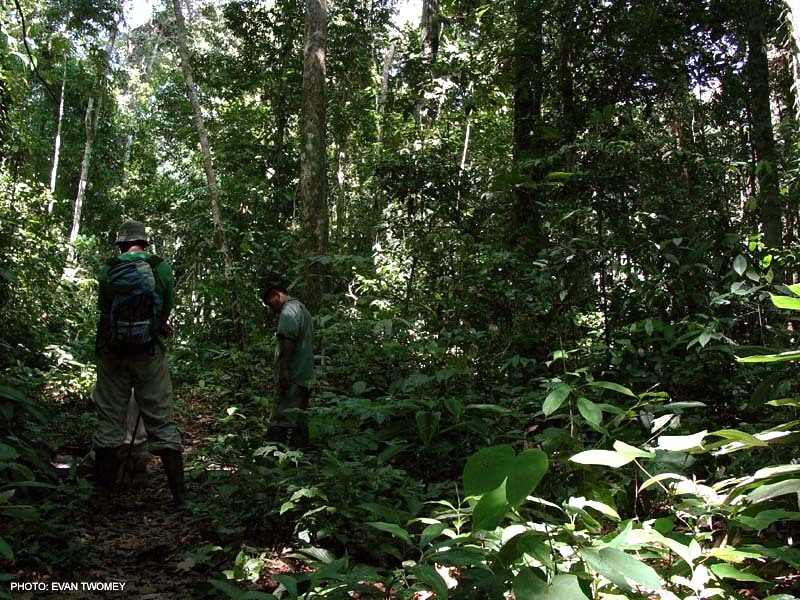 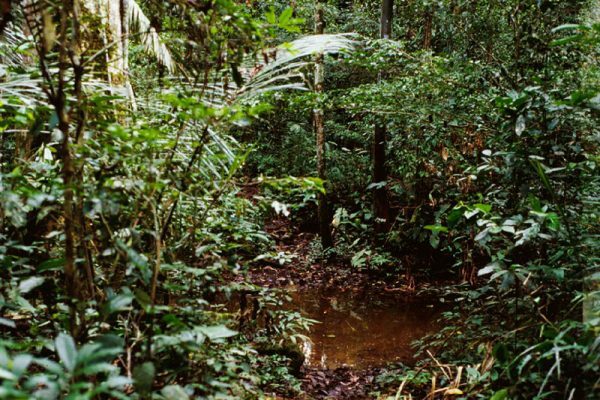 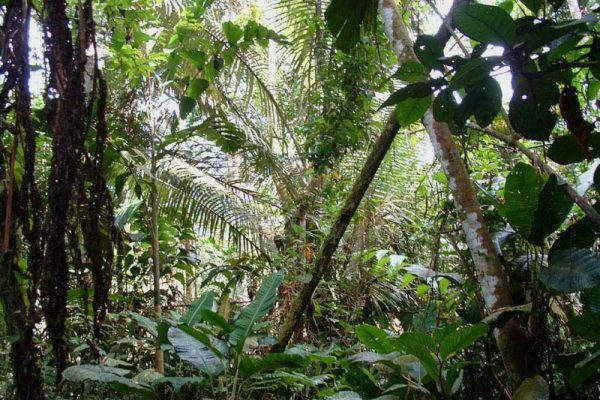 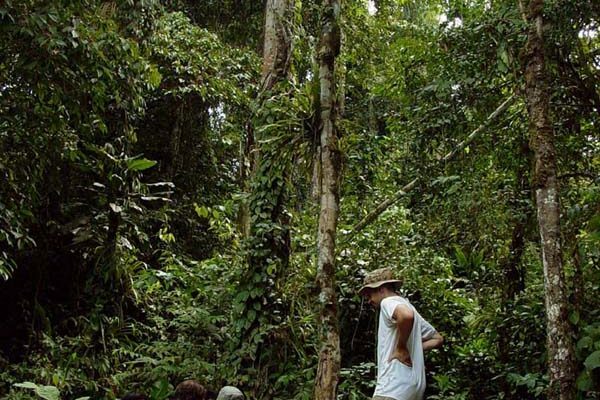 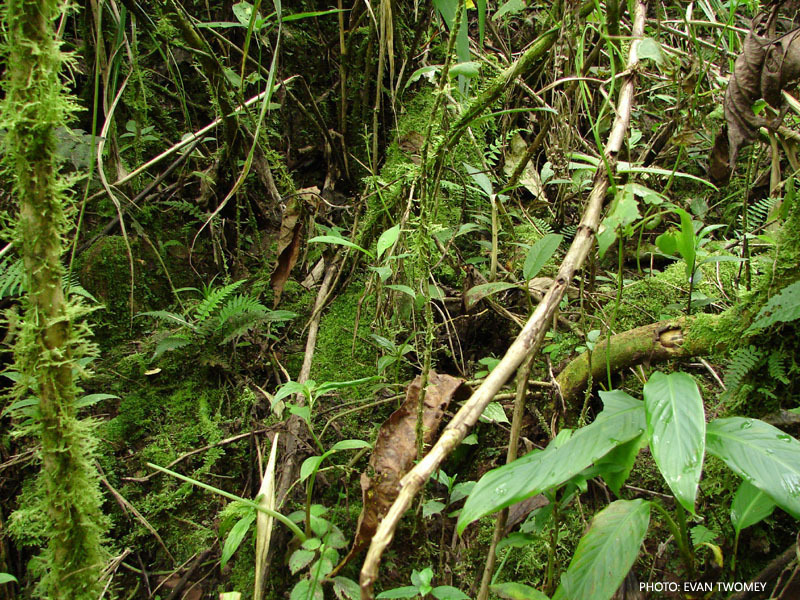 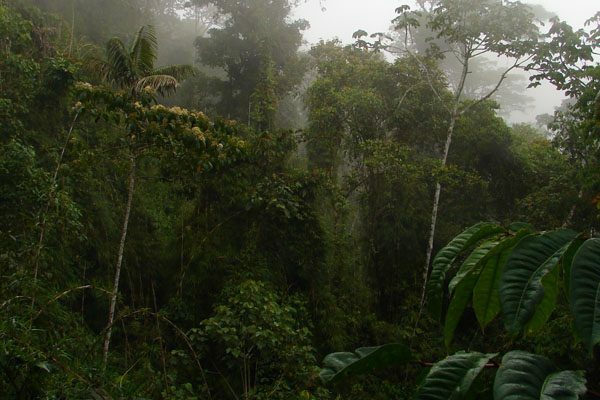 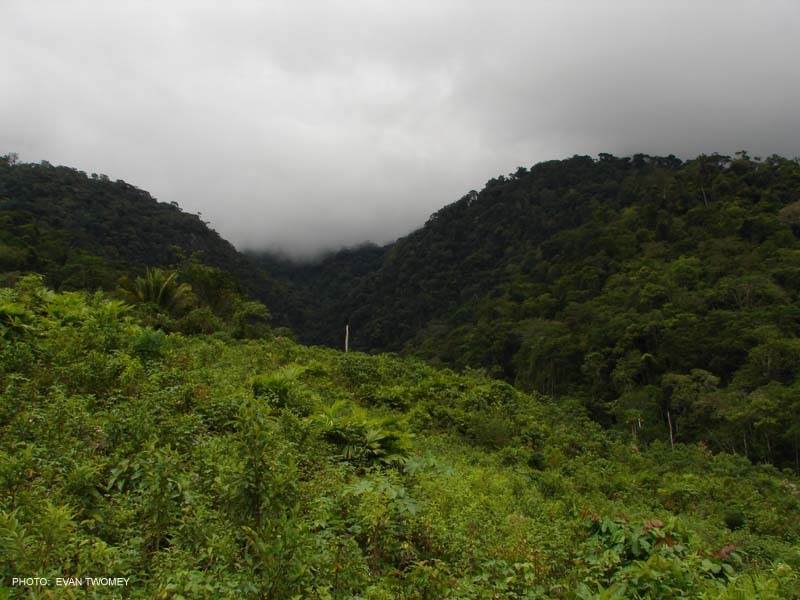 This type of habitat is characterized by wet, cool conditions but to a lesser degree than cloud forest. 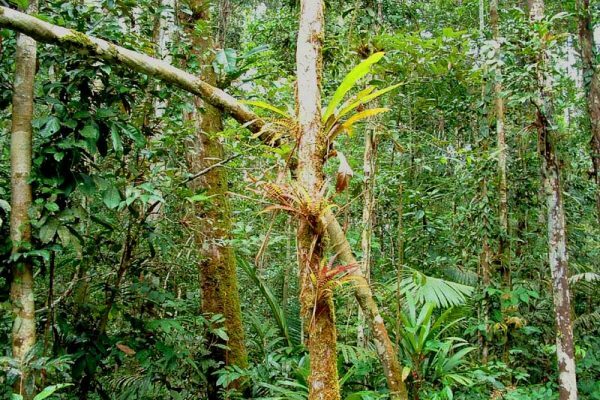 Epiphytes are abundant, particularly bromeliads and orchids, and the trees tend to be somewhat bigger than those found in cloud forest. Dendrobatid diversity is substantial at these altitudes – almost 1/2 of the species of Dendrobates (sensu lato) occur over 1000 m, many of which are restricted to these high elevation forests. 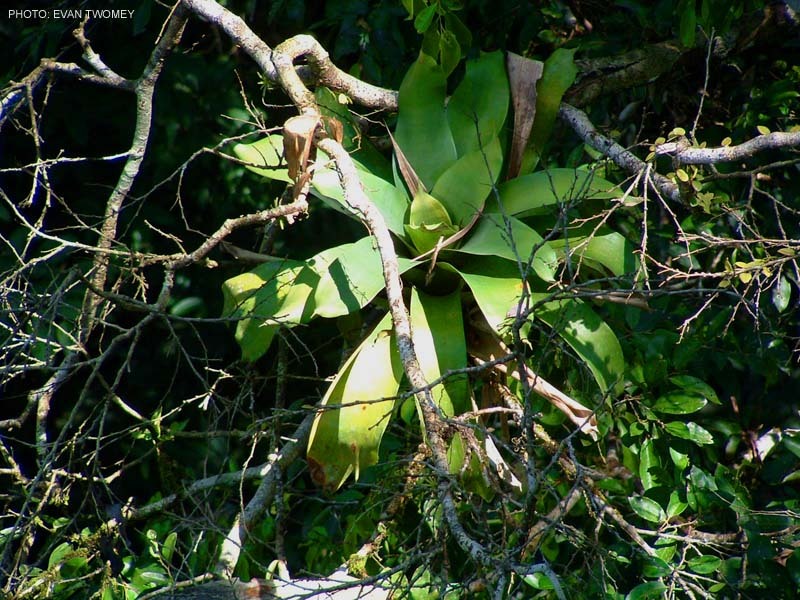 Bromeliads tend to be large and suitable for dendrobatid reproduction, and the presence of Heliconia and Xanthosoma provide additional reproduction sites. 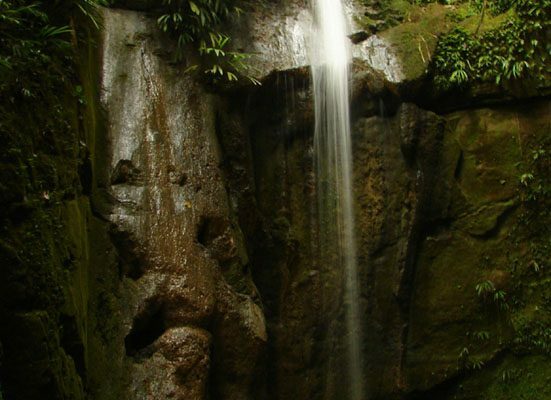 Terrestrial Ameerega can be found breeding in slack waters alongside brooks – standing water in steep, mountainous forests is a rare commodity. 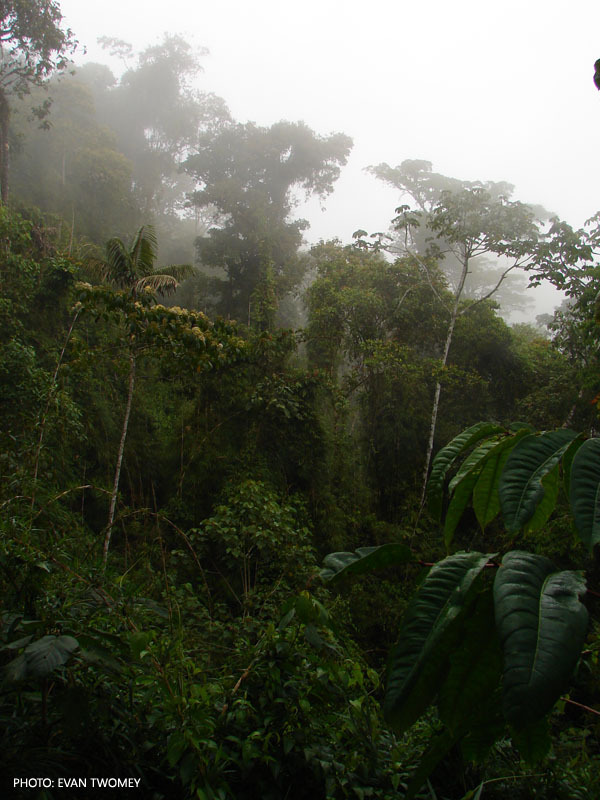 Daytime temperatures usually range from 22-24 C, with about a 5 degree drop at night. 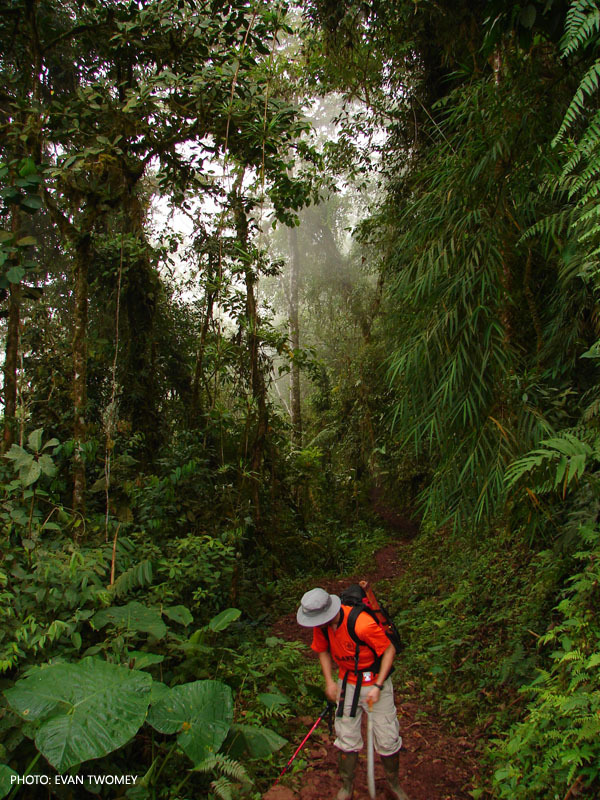 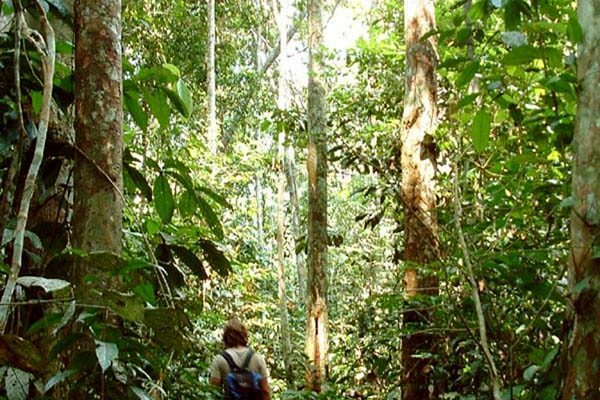 Walking through a cloud forest is a memorable experience. 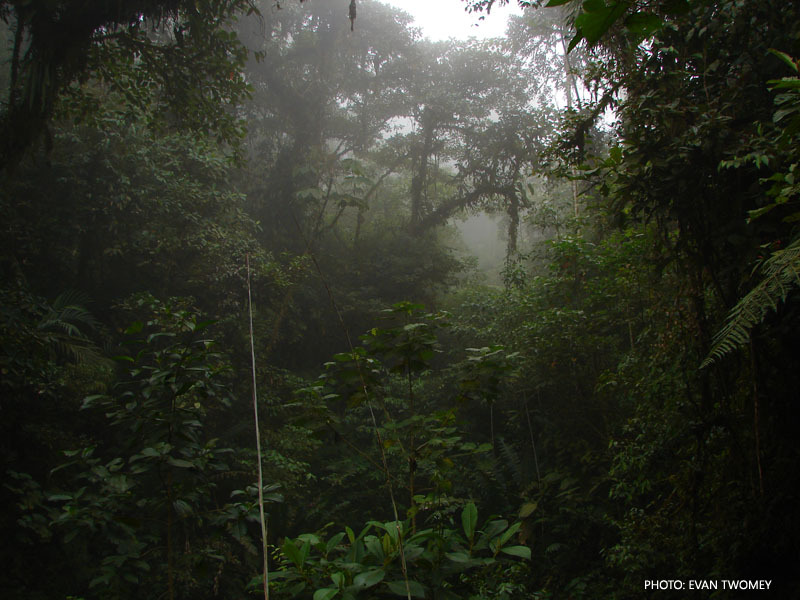 Trees are dwarfed and epiphyte laden, moss hangs from every surface, and the perpetual cloudiness gives the landscape an otherworldly feeling. 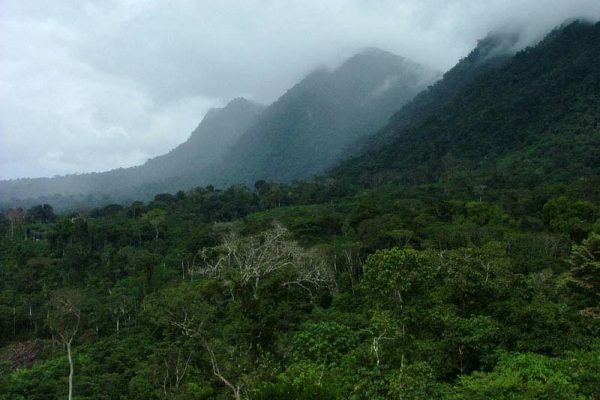 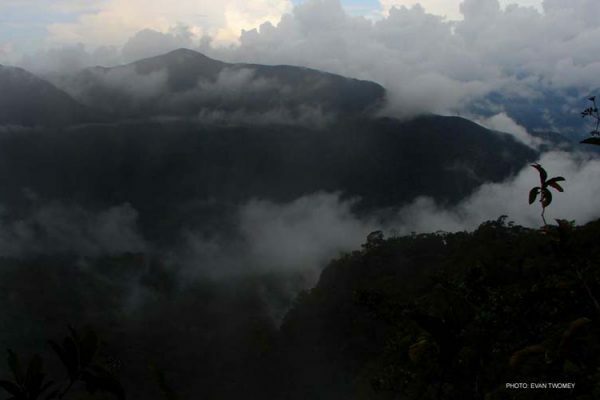 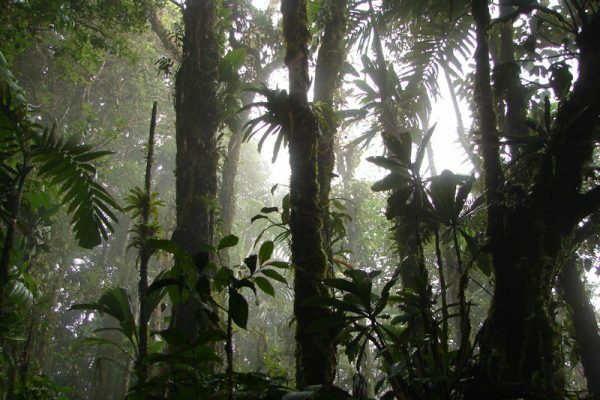 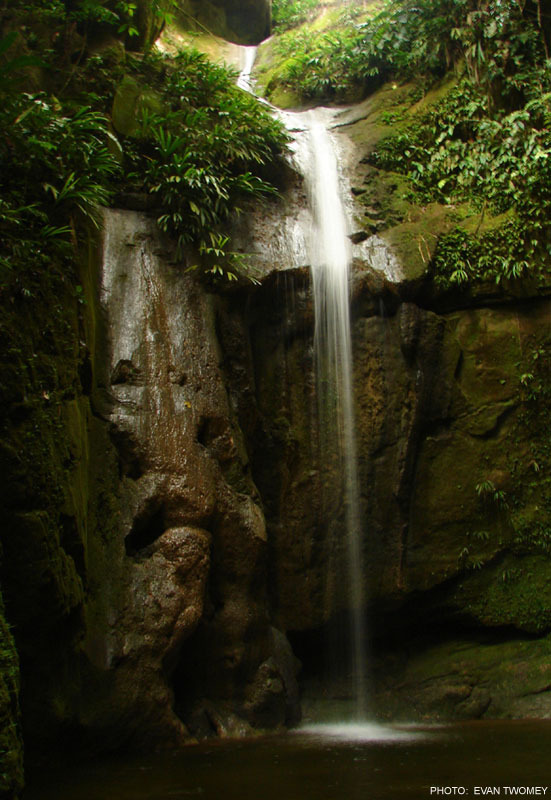 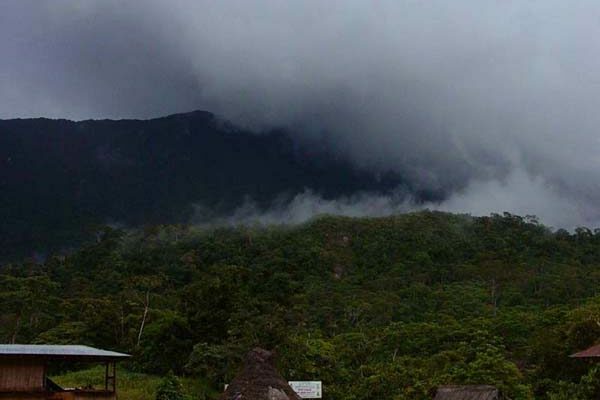 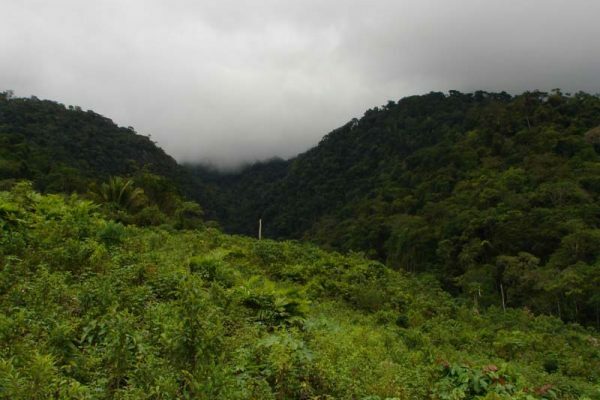 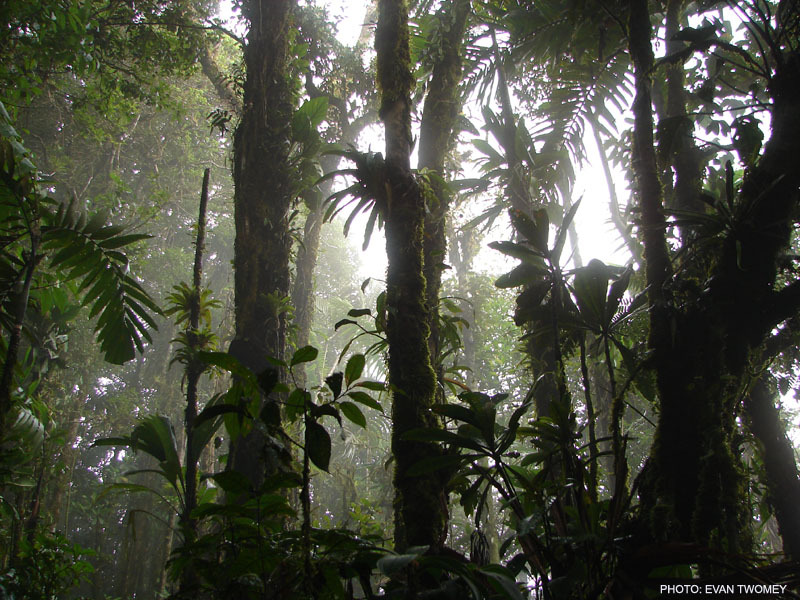 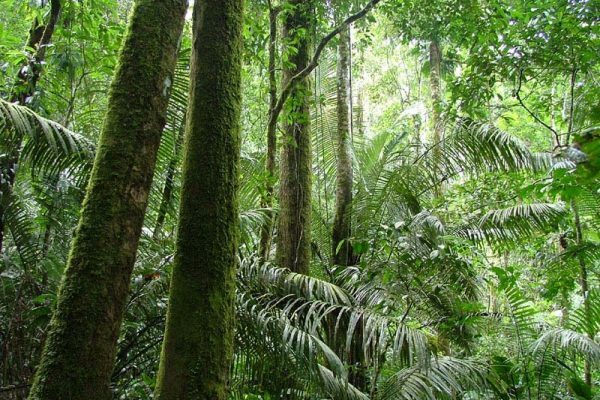 Cloud forest usually starts at around 1500 meters above sea level, though this depends also on rainfall. 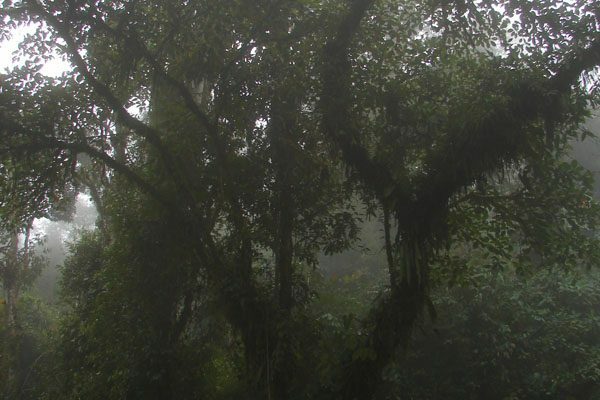 Very wet areas, such as the dividing range in Panama, can see cloud forest as low as 1000 m. Despite the abundant bromeliads, dendrobatids are usually absent from such high altitudes. 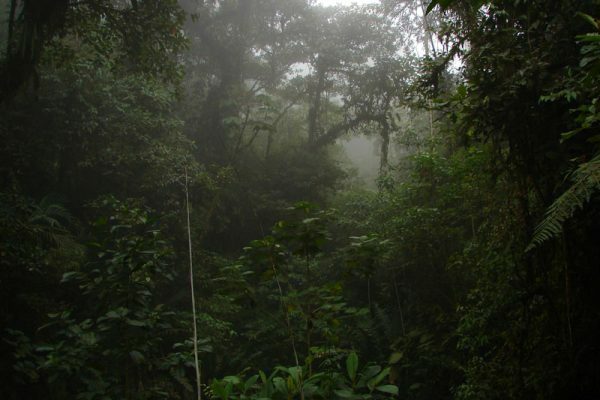 There are, however, exceptions, such as Oophaga arborea from a relatively low cloud forest (1200 m) in Panama, Ameerega silverstonei from Central Peru (1500 m), and the newly described Ranitomeya daleswansoni from the Cordillera Central of Colombia (1900 m).